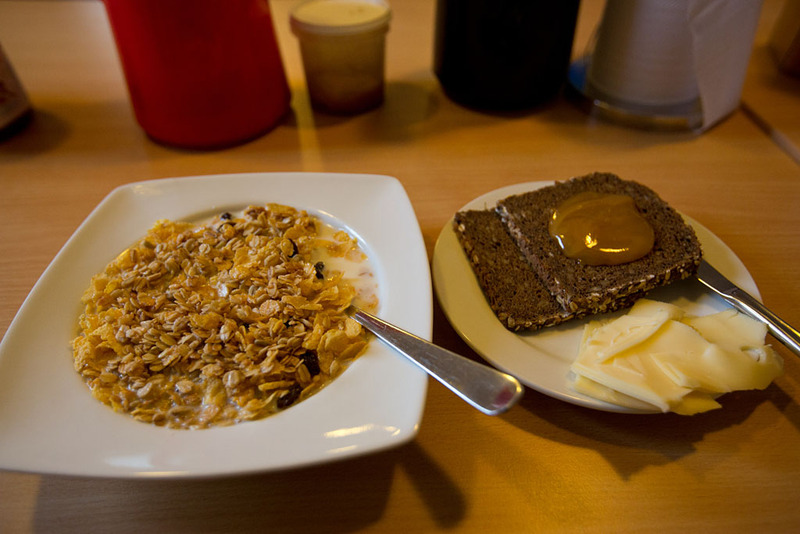 After a surprisingly good sleep on one of the very narrow beds at the Old Camp, I had some breakfast of cereal, bread and cheese. 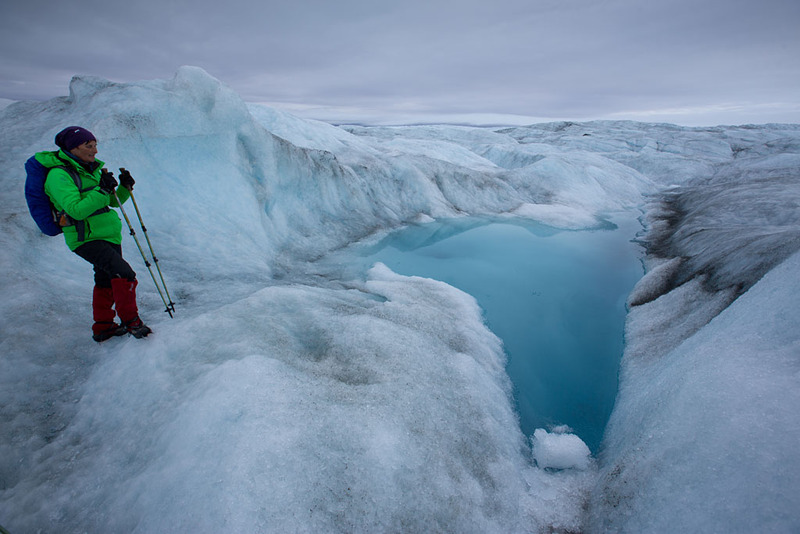 Today's plan was to head out to the Greenland ice sheet just after lunch, with free time until then. 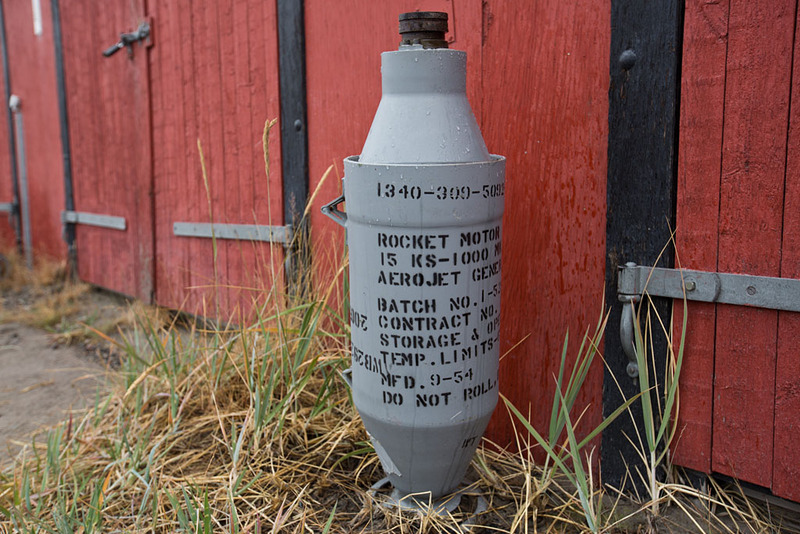 I had a walk around the Old Camp, and there were numerous spent JATO (jet assisted take-off) rockets all around, used to prop open doors, as ash-trays or just lying randomly on the ground. 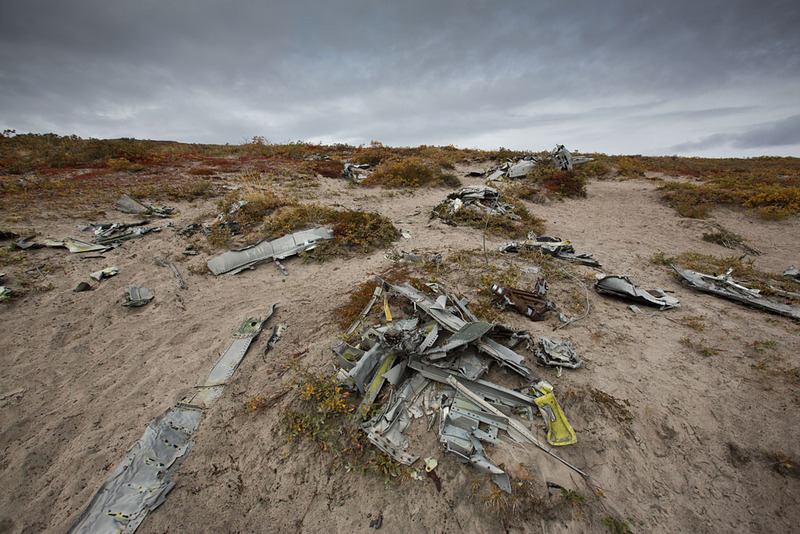 They had apparently been used for take-offs when military aircraft took off from prepared runways on the ice sheet. 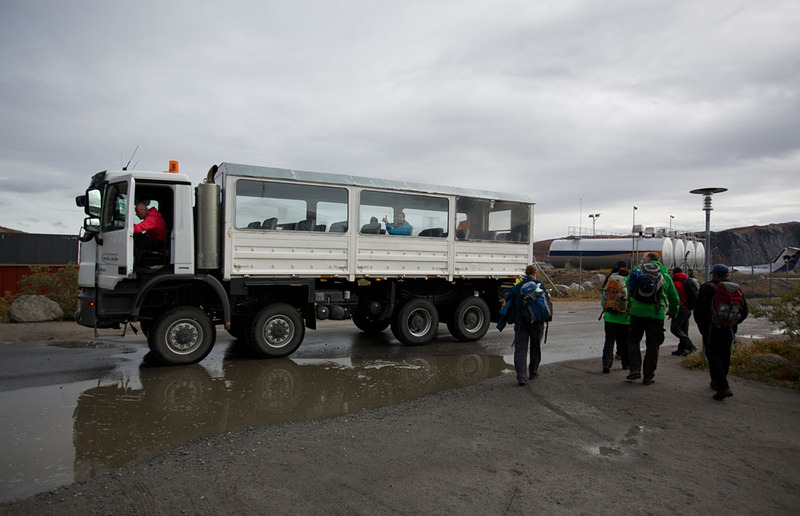 The Old Camp had a regular bus service for the 2 kilometre ride into town, so at 9am I joined some of the others to see some more of Kangerlussuaq. After the bus dropped us off at the airport, I went out for a bit of walkabout. 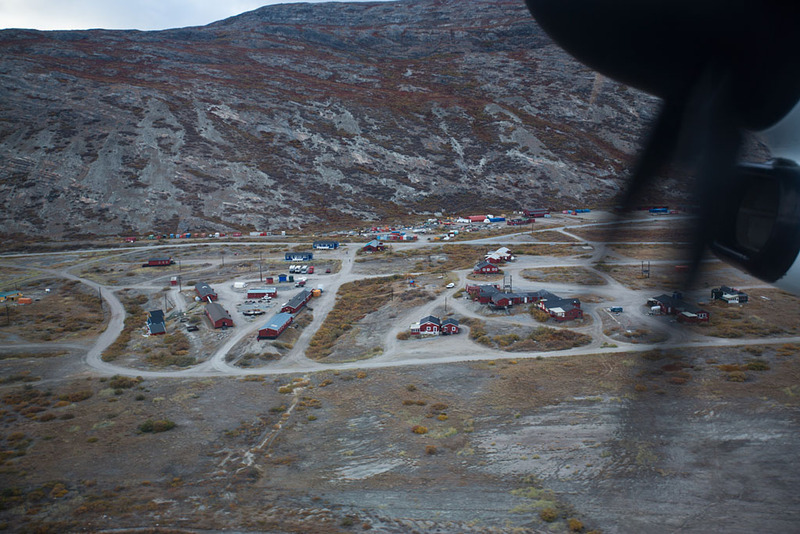 The population of Kangerlussuaq is only ~500 and are reliant on the airport and tourist industry. On the main road near the western end of the airport. 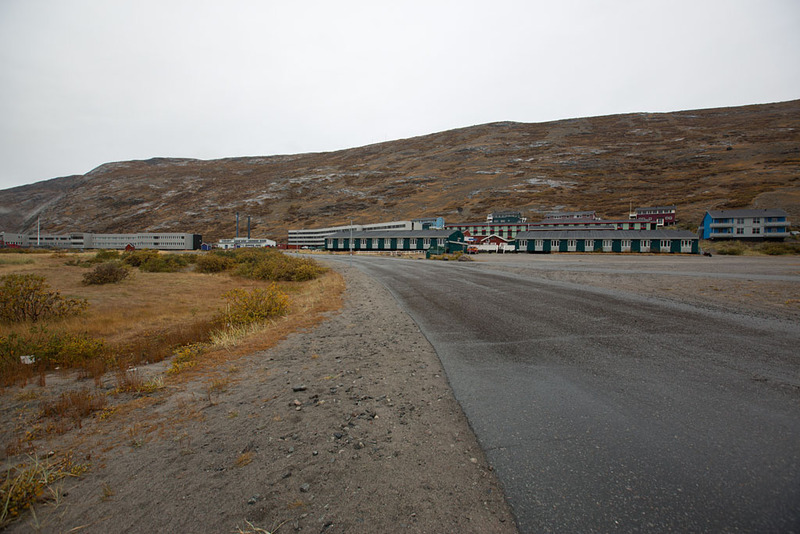 Kangerlussuaq airport has the longest runway in Greenland and is only one of two airports that are capable of accepting wide body aircraft. Looking back into town. 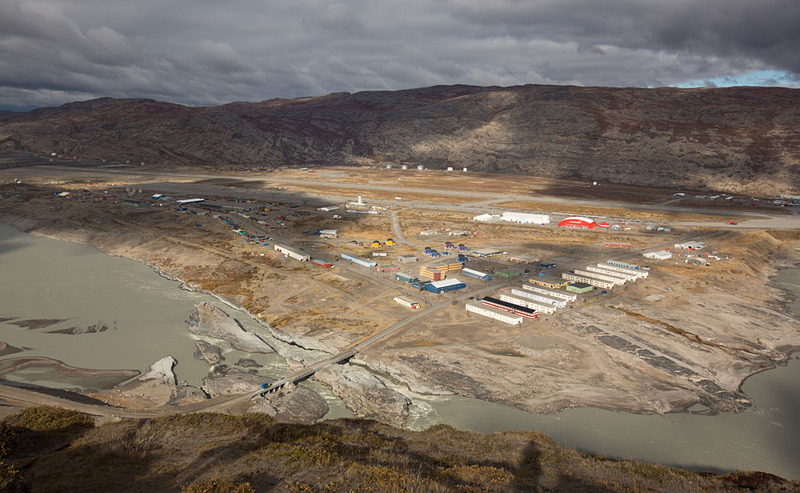 Kangerlussuaq is situated 50 kilometres north of the Arctic circle. 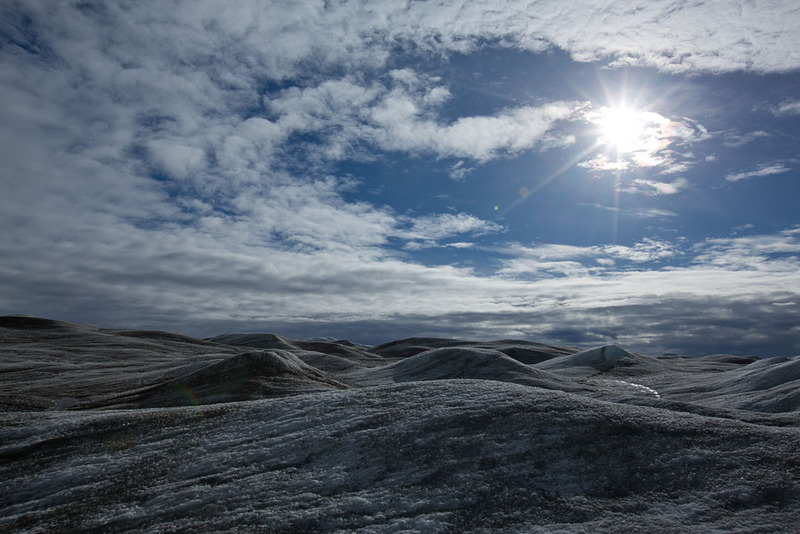 In the winter temperatures dip below -20°C celsius and the amount of daylight reduces to less than 2 hours. I stopped by the local supermarket to pick up a few things. 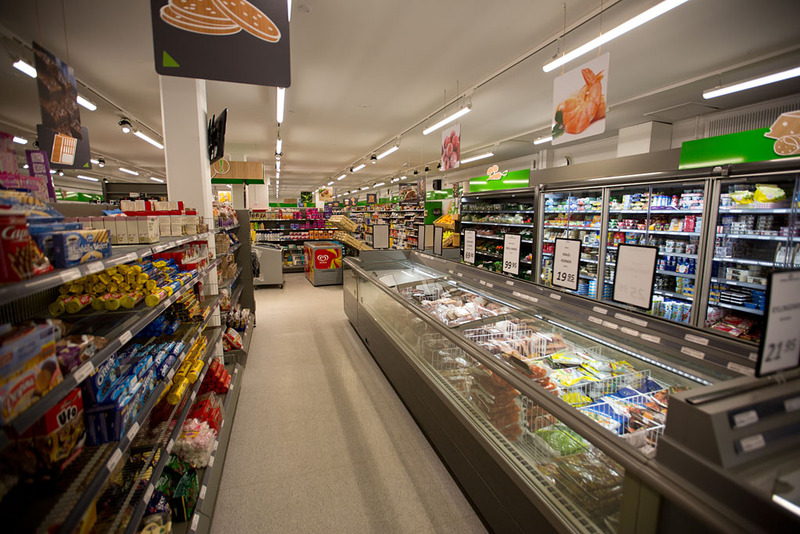 It was surprisingly well stocked and prices were all in Danish Krone, the currency of Greenland. 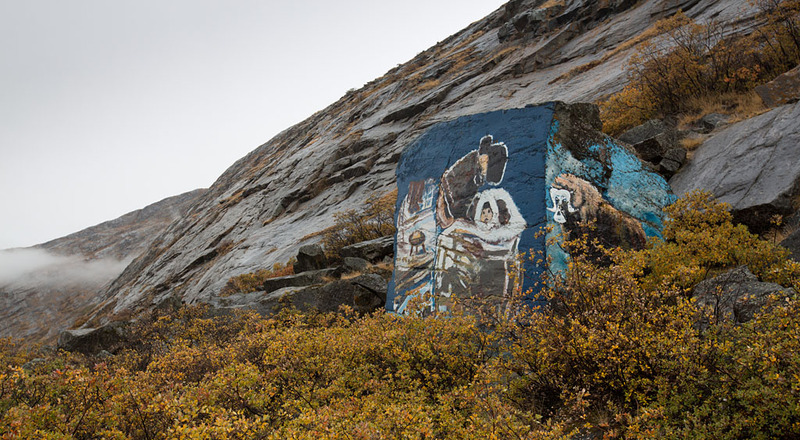 A mural of a Greenlandic child and a woolly Muskox. I then walked the ~2 kilometres back to the Old Camp. 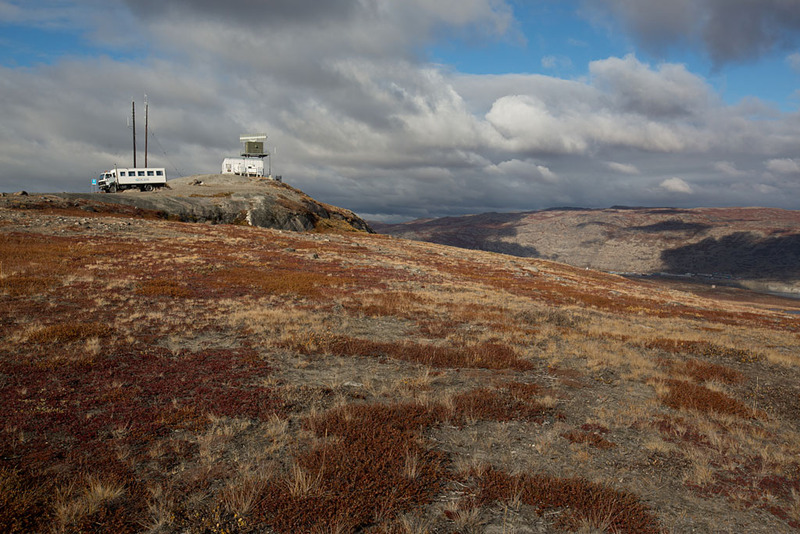 Looking east back to Kangerlussuaq. I hung out at the Old Camp for the rest of the morning and packed my pack for the overnight trip to the ice sheet tonight. At about 12pm I was picked up in an old red Toyota truck by our guide for the trek, Elouise. 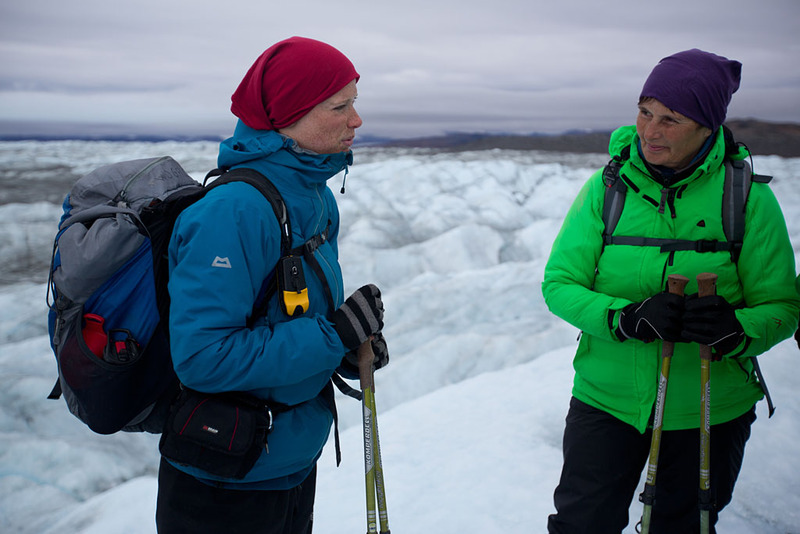 Back in Kangerlussuaq we had a briefing to make sure we had packed correctly and that our boots were ok for wearing crampons on the slippery ice. As well as myself, there was a German couple, two Swiss guys and a retired gentleman from Indonesia. 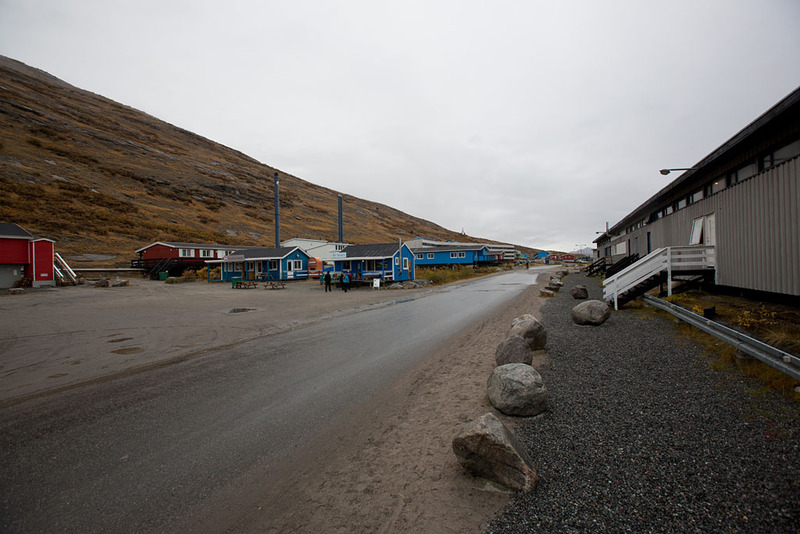 Our truck ride up to the ice sheet was at 1pm, so I grabbed some lunch at the airport cafeteria which also doubled as the town cafeteria. 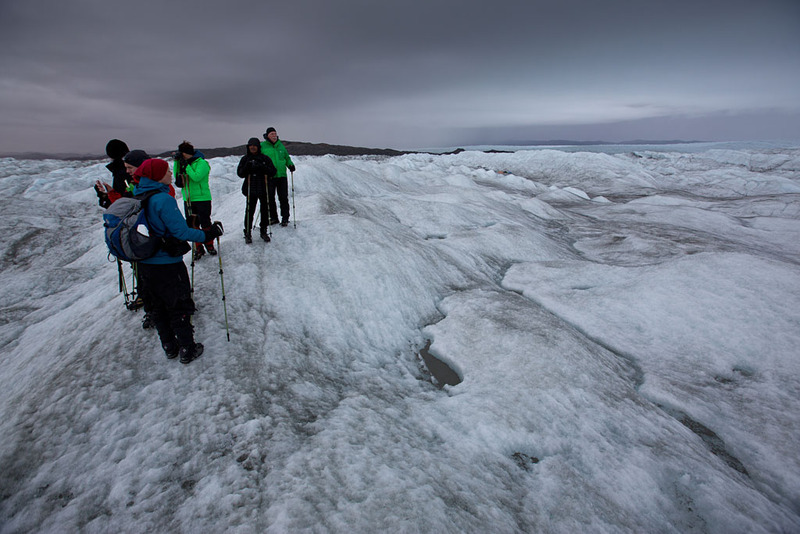 Just after 1pm our ride arrived and we began the 37 kilometre drive to the ice sheet. Also on the truck where some other people going up for a short day trip including Peter and Gorum. 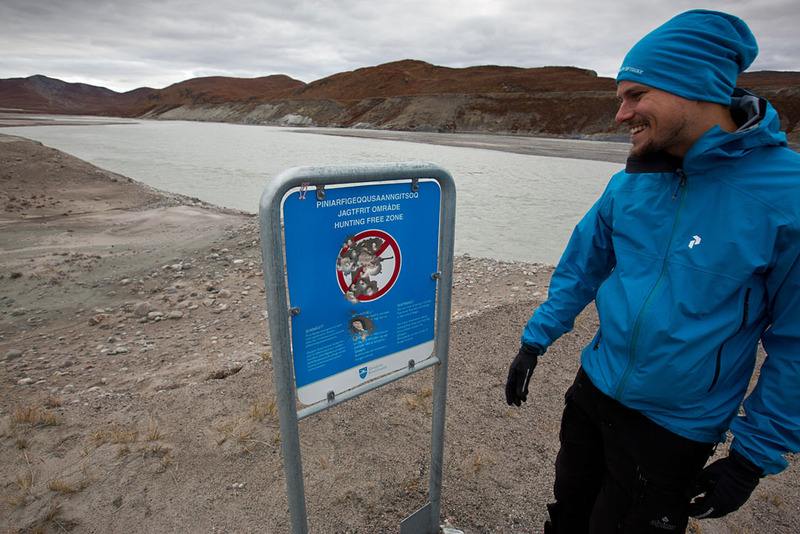 The road up to the glacier was not sealed, and would take us about 2 hours including breaks to reach the edge of the ice sheet. As we headed east, our guide Elouise gave us a bit of a commentary of the sights on the way. 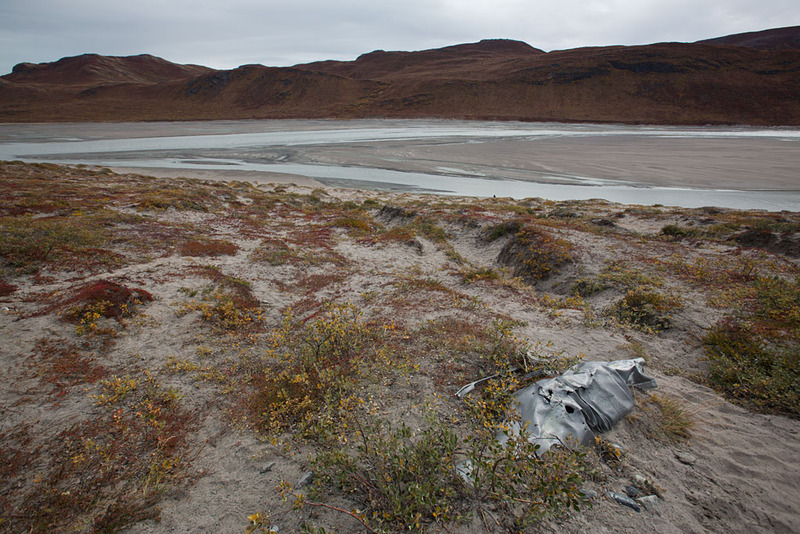 First was the “forest” of Kangerlussuaq. They attempted to plant a few trees of different varieties many years ago to see if they would grow. 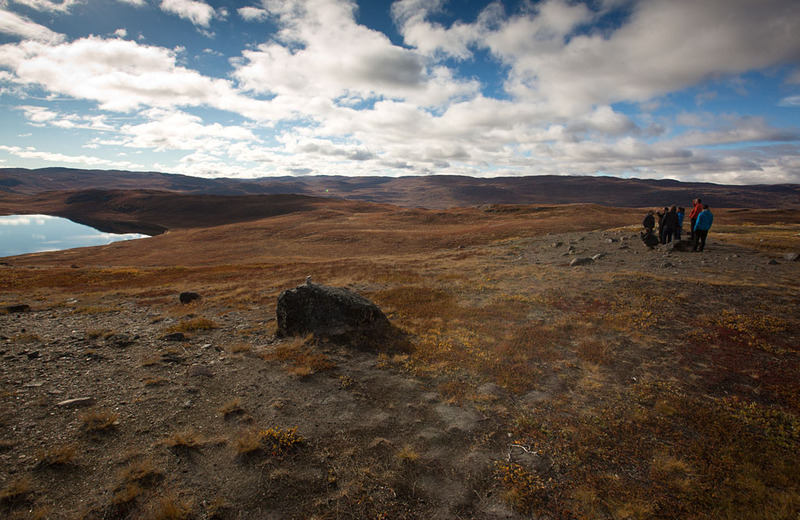 Only a handful of the trees still remain though, fighting the permafrost. 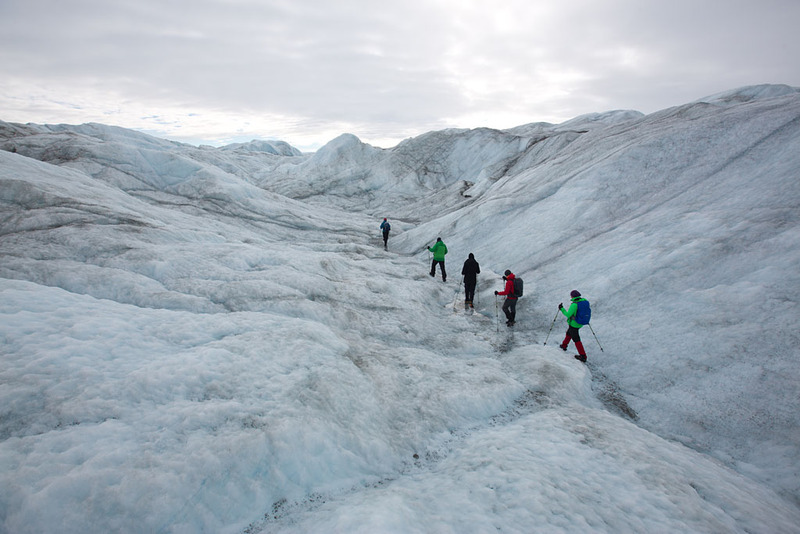 The road to the ice sheet was 37 kilometres, and including the 12 kilometres of road west of Kangerlussuaq, it is the longest road in Greenland. In fact, there is only 150 km (90 mi) of roads in the whole country, of which 60 km (40 mi) are paved. In 2000, a car testing company built the road up to the ice sheet, as well as 150 kilometres of road on the ice sheet itself for the purpose of testing cars for Volkswagen. 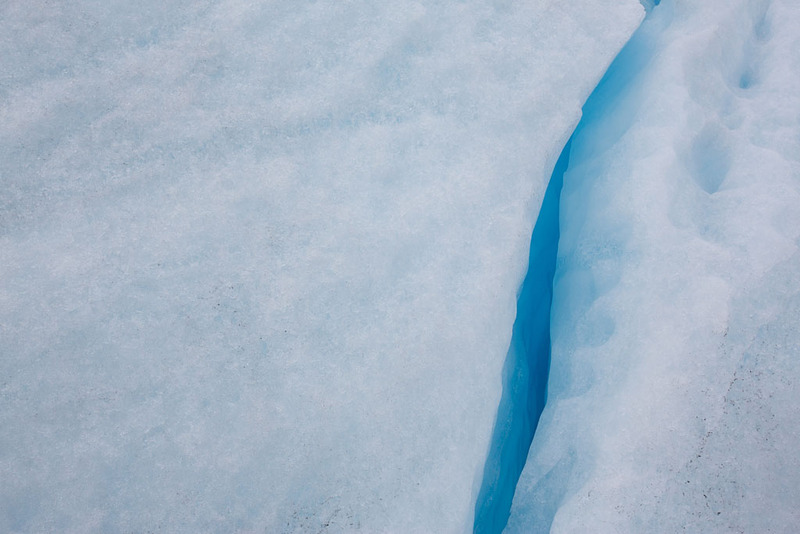 The testing was abandoned in 2006 however and the road leading to the edge of the ice cap is now maintained for tourist purposes only. 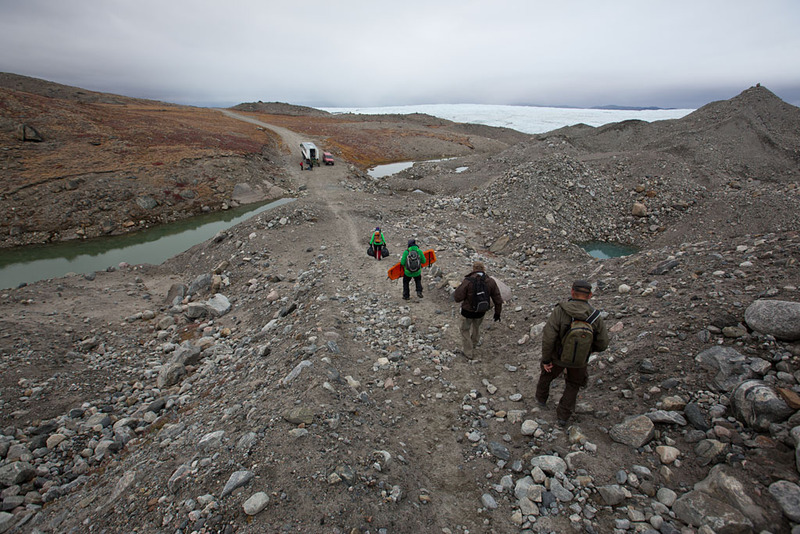 Ice activity has demolished the inland ice segment of the road and it now ends in Isunngua, on the edge of the ice sheet. 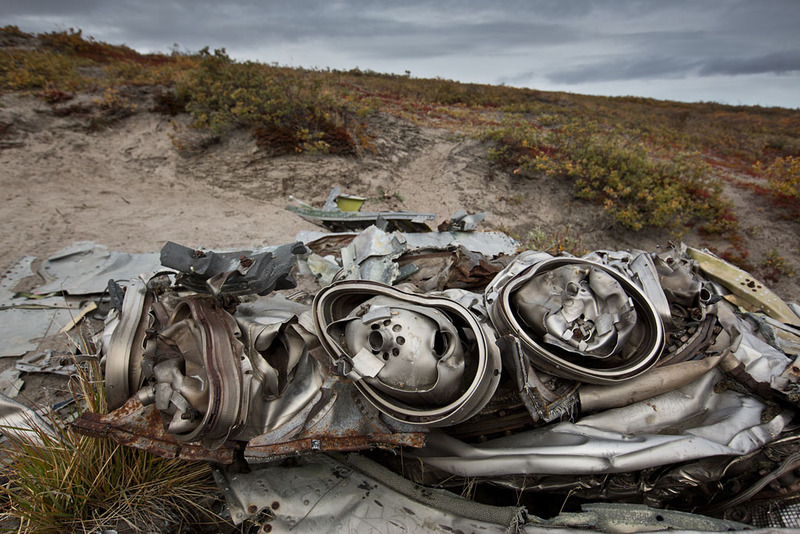 After about 30 minutes we stopped at the crash site of a Lockheed T-33. 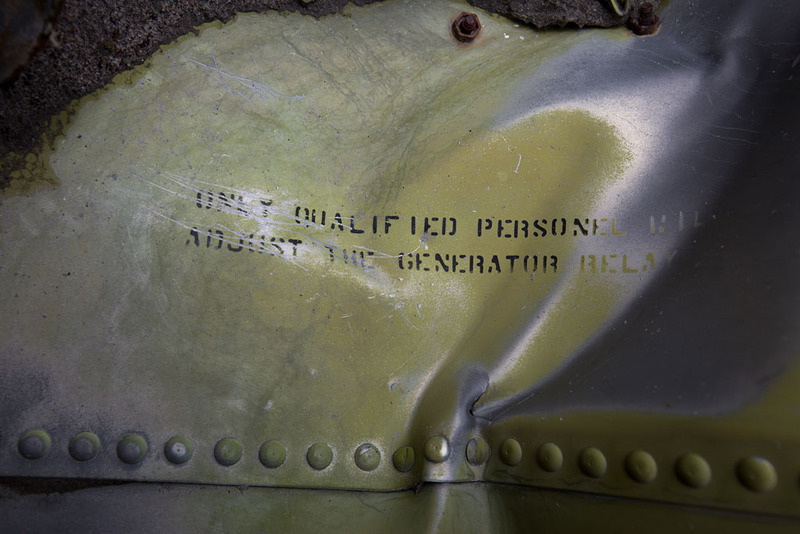 The T-33, a jet trainer, was one of three that had crashed during a blizzard in December, 1968. 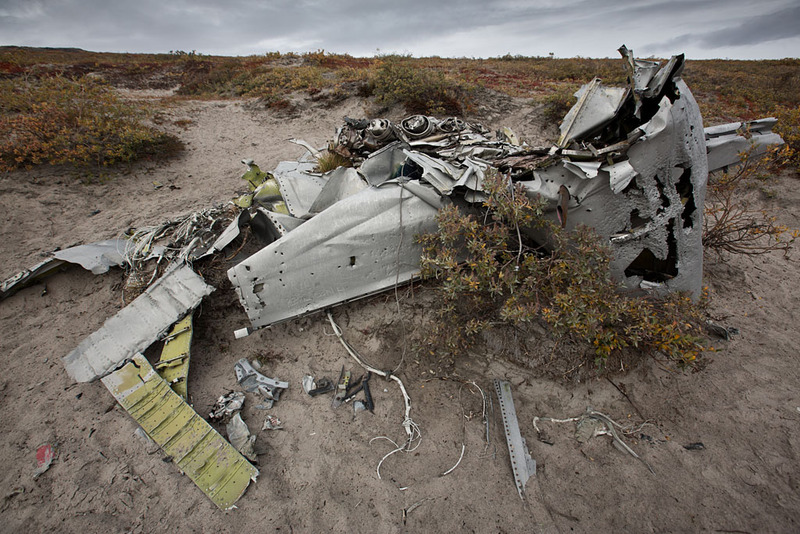 They had been flying on a training flight from Goose Bay, Newfoundland. The three T-33's were accompanied by five F-5's. 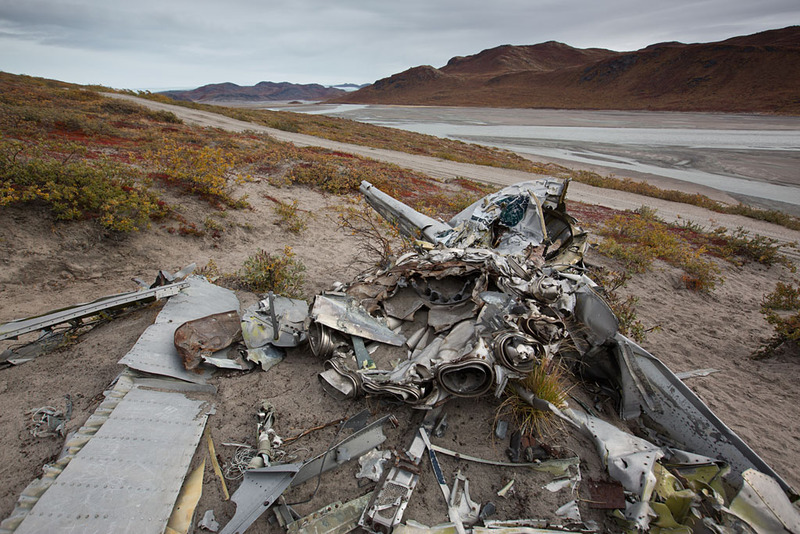 The F-5's were able to land at Kangerlussuaq after guidance from the air traffic control tower. But the T-33's were not able to land though, and continued to circle. The T-33's eventually ran low on fuel, and the three pilot's ejected out into the blizzard conditions. 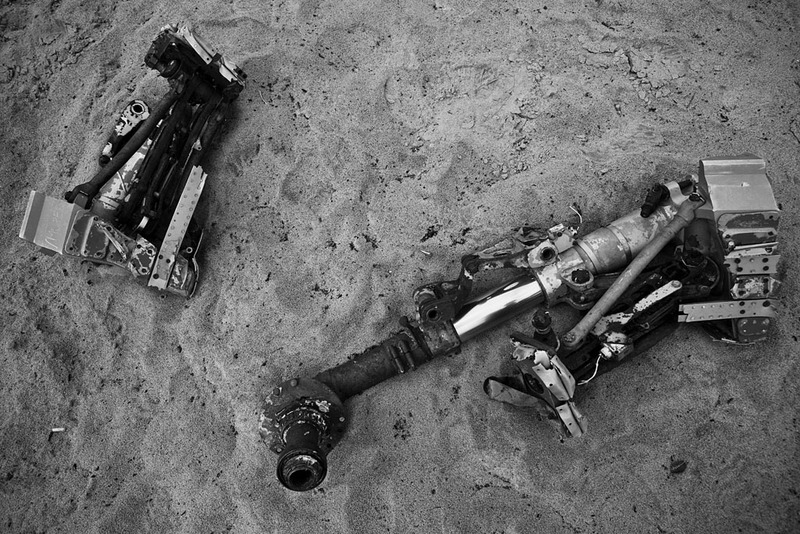 The three pilots were successfully rescued with no loss of life however. 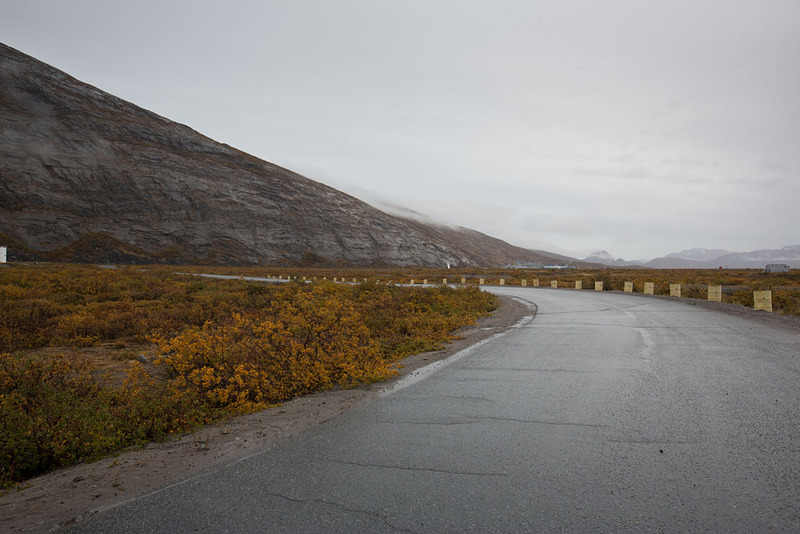 We then continued the drive east on the road to the ice sheet. 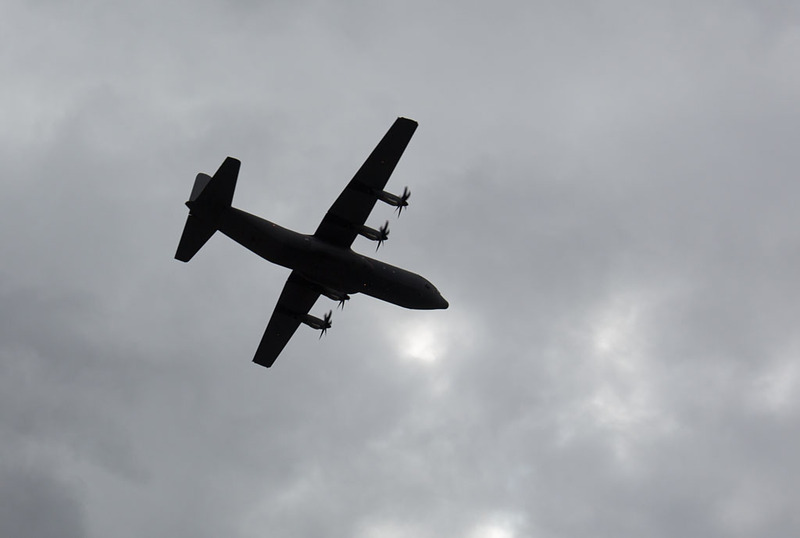 A Royal Danish Air Force C-130J was flying low over the terrain just to the south. Elouise said that as Denmark is relatively flat, when the Air Force wants to practise flying over terrain they fly out to Greenland instead. Stopping again to take in the view of Long Lake. At about 3pm, we arrived at the end of the road. 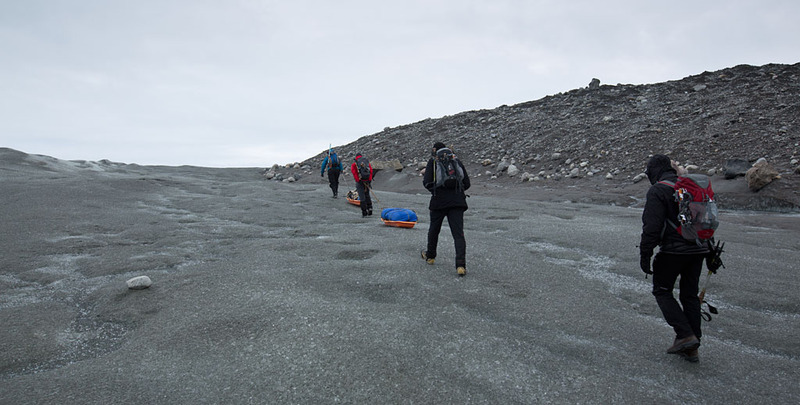 After carrying our gear for the short walk to the ice sheet, we loaded up three sleds with sleeping bags and other gear. I volunteered to tow one of the sleds and it was surprisingly easy with the lack of friction on the slippery ice. 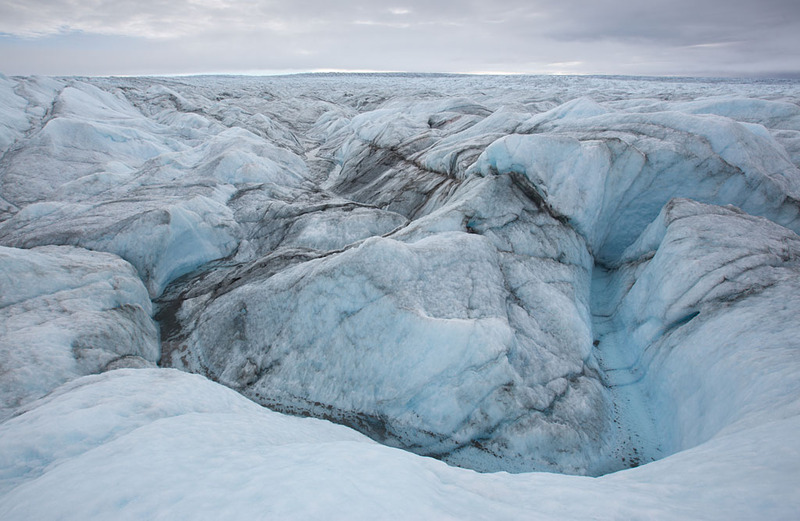 On the edge of the ice sheet, dust that is made from the grinding of the ice on rock is blown back on to the top of the ice, making it look grey. The sun and some blue sky visible for the first time. 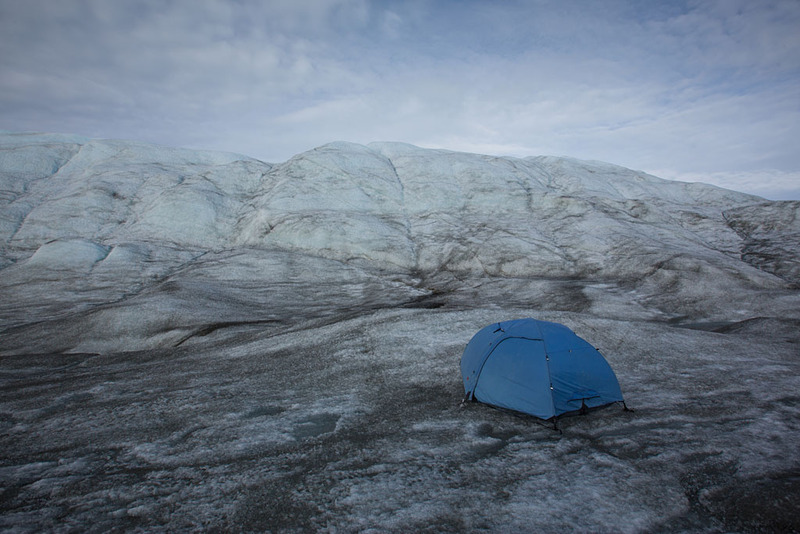 After the 30 minute trek, we made it to our ice sheet campsite for the night. After a few false starts, I had my dome tent set up all ok. 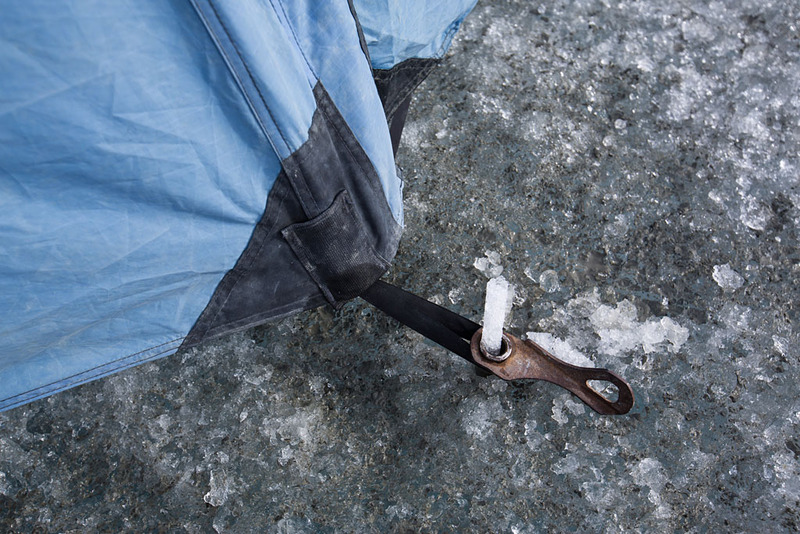 Instead of normal tent pegs, we secured our tents each with four ice screws anchored into the ice. After setting up our individual tents we got to work on the big communal tent. Trying to thread the countless poles! After a bit of effort and teamwork we managed to get all the tents set up for the night though. 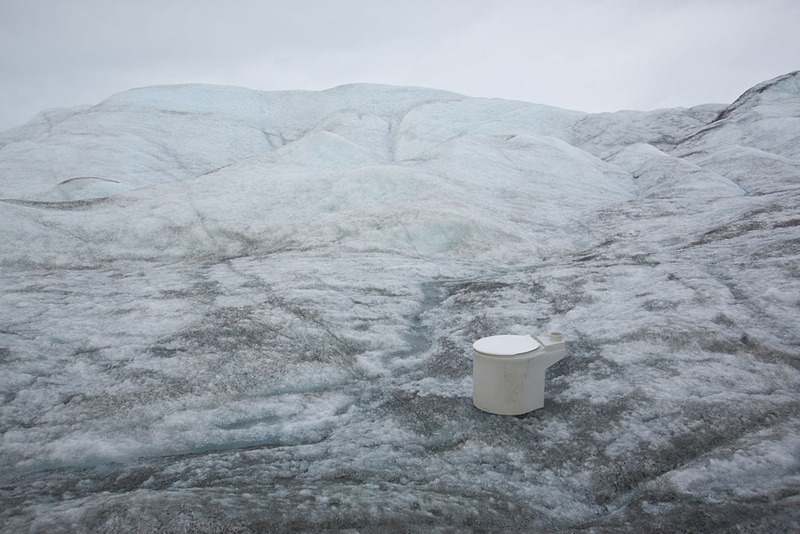 And just behind an ice hill down the end of the camp was our 'bathroom' when we needed to go! 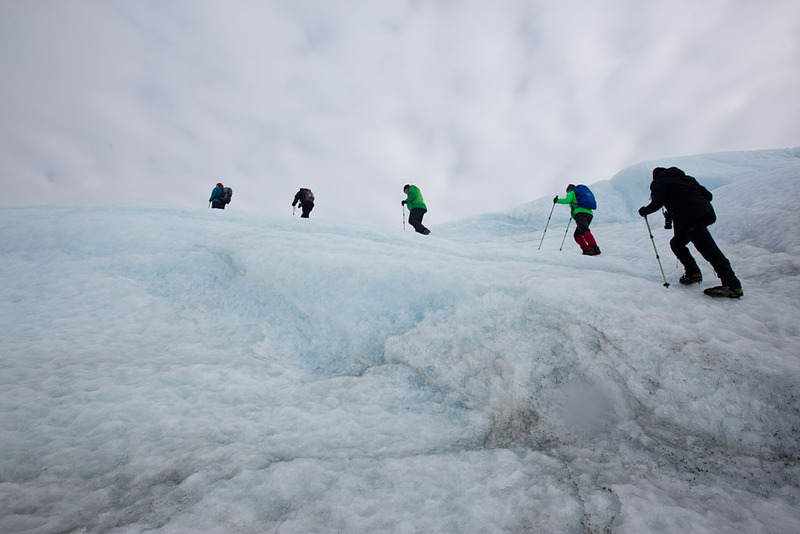 We had to put a trekking pole sticking out of the nearby ice hill to signal when it was occupied. 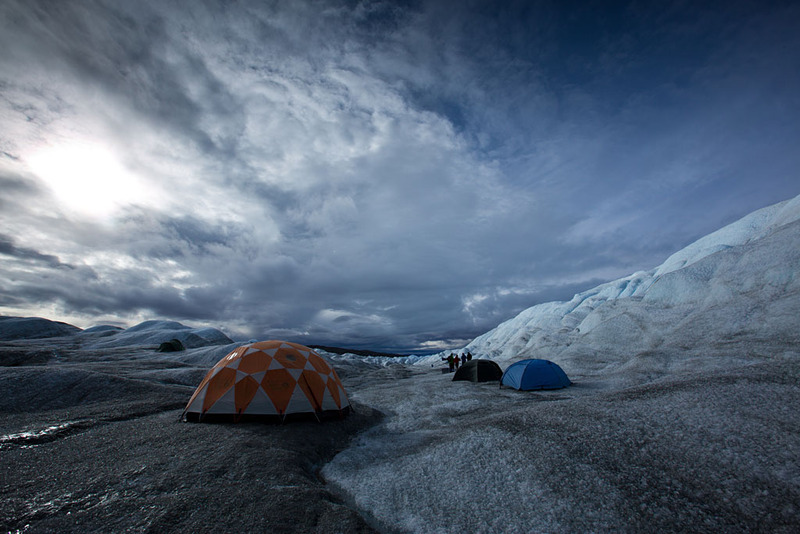 At about 5:30pm and with our camp all set up, we met in the communal tent for dinner. 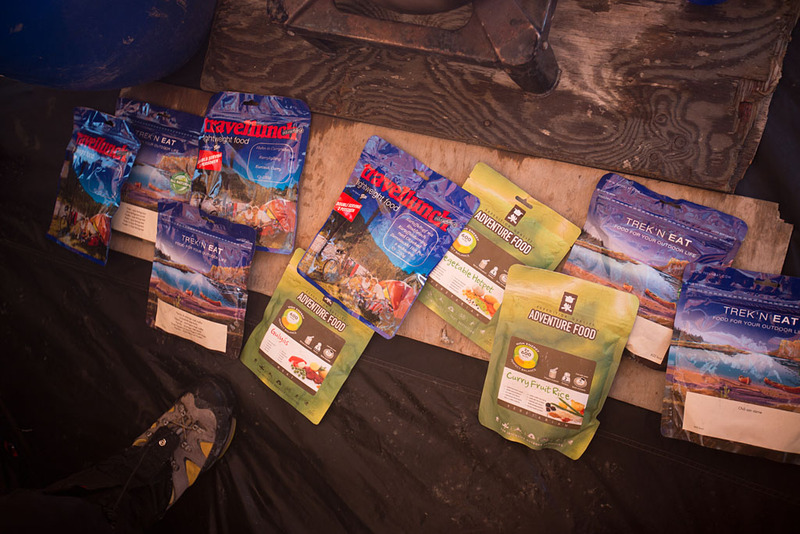 Tonight's menu was a choice of various freeze-dried meals. 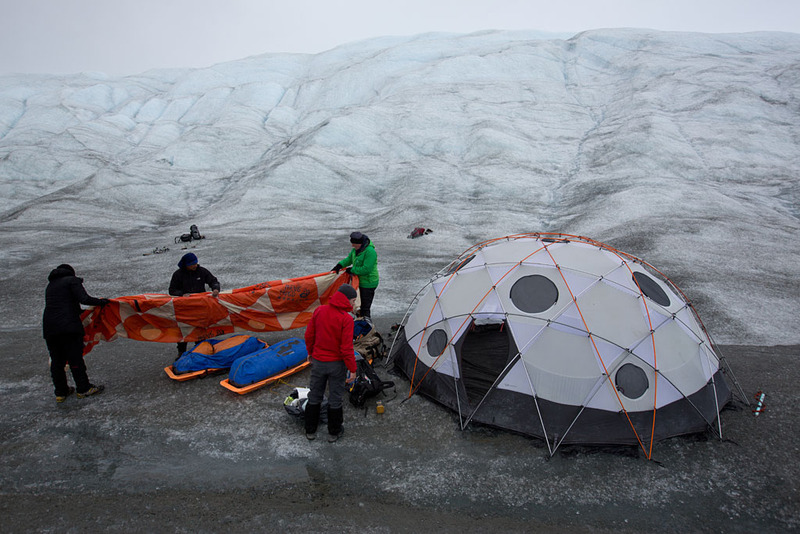 The tent warmed up pretty well with the gas stove going while we boiled the water to rehydrate our dinner meals. Over dinner Elouise related a story when she had a couple of luxury travel writers who had arrived in Greenland on a cruise ship, and had decided to do the overnight ice sheet trek. They were definitely not used to such a 'spartan' excursion, and were surprised when they had to set up their own tents and asked what drinks were available to buy at the camp! After the basic but very filling dinner, Elouise gave us a quick lesson on how to put on and how to walk (i.e. 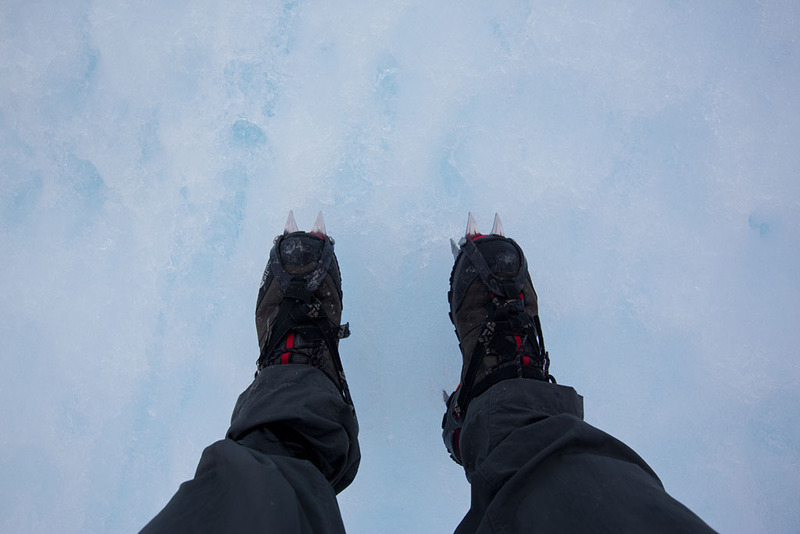 like a cowboy with a wider stance so you don't accidentally spike your calf) while wearing crampons to give us traction and stability on the ice. 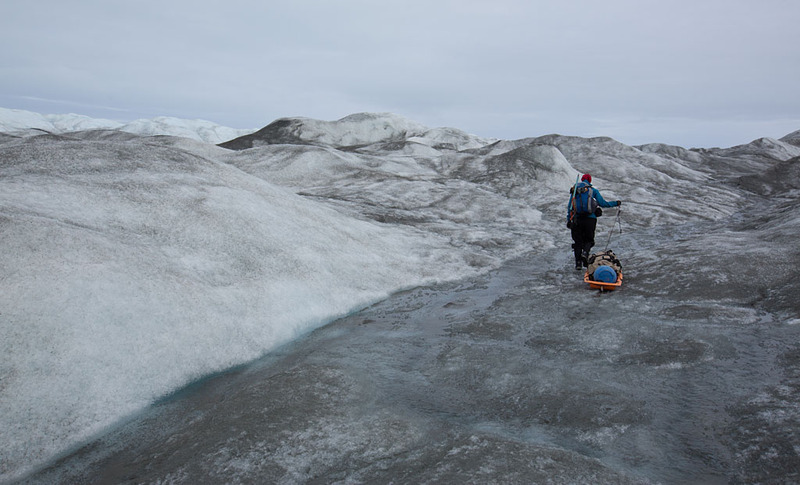 We then headed out for an evening trek on the ice sheet. 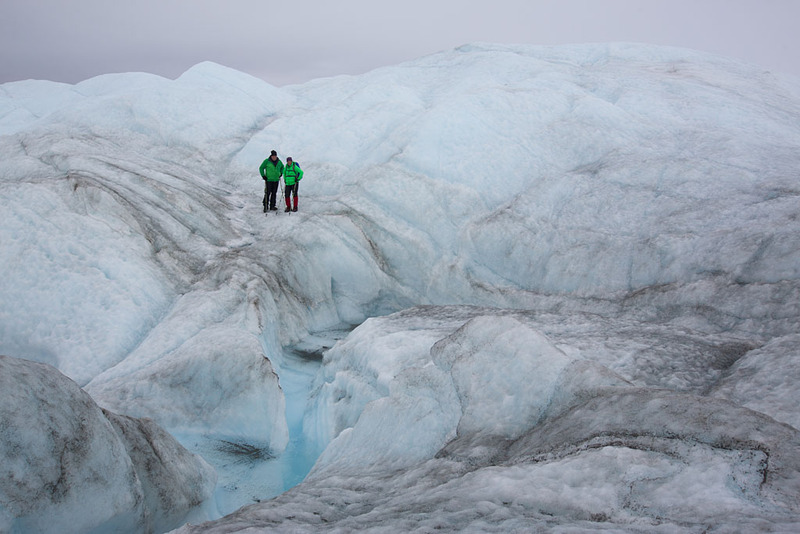 Such an amazing experience with the seemingly endless ice going on beyond the horizon. 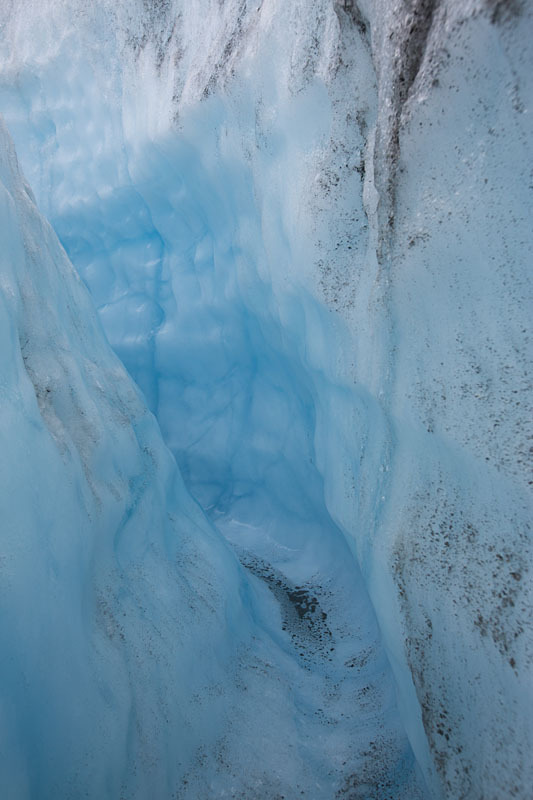 Looking down a crevasse. In winter these are covered in loose snow so are much harder to avoid. Elouise was carrying 50 metres of rope in case any of us fell in, but given the depth (up to 30-40 metres), I am not sure if anyone would survive such a fall. Me posing for a photo on the ice! I had four layers on top and while it was cold, once we were moving and keeping warm it wasn't too bad. Elouise looking out over the ice. The desolate landscape, almost total lack of life, and the endless white expanse really reminded me in some way of the sandy desert back in the Arabian peninsula. 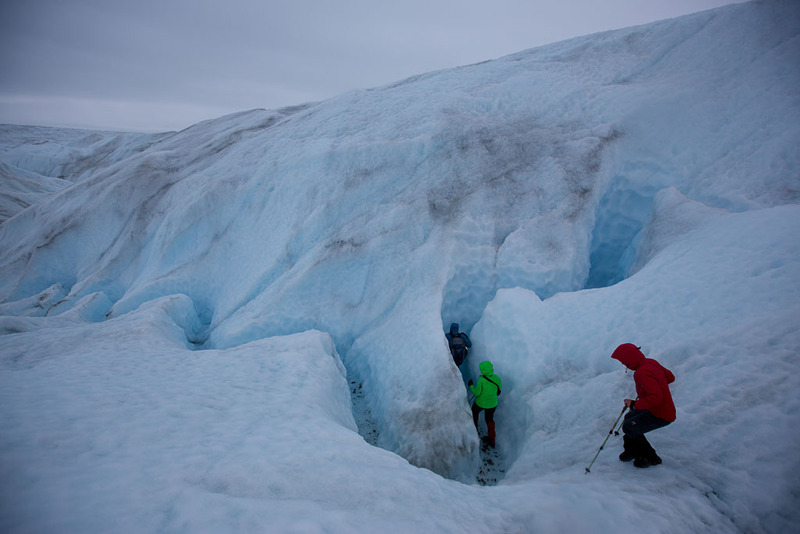 Walking down to check out a channel carved out of the ice. And getting up close to see the definite blue hue. Elouise leading us across the icy landscape. I had very little sense of direction and which way the camp was and where we were with regards to it. Although Elouise had a GPS just in case, she was very familiar with the different ridges and other features of the landscape and expertly guided us without getting lost at all. 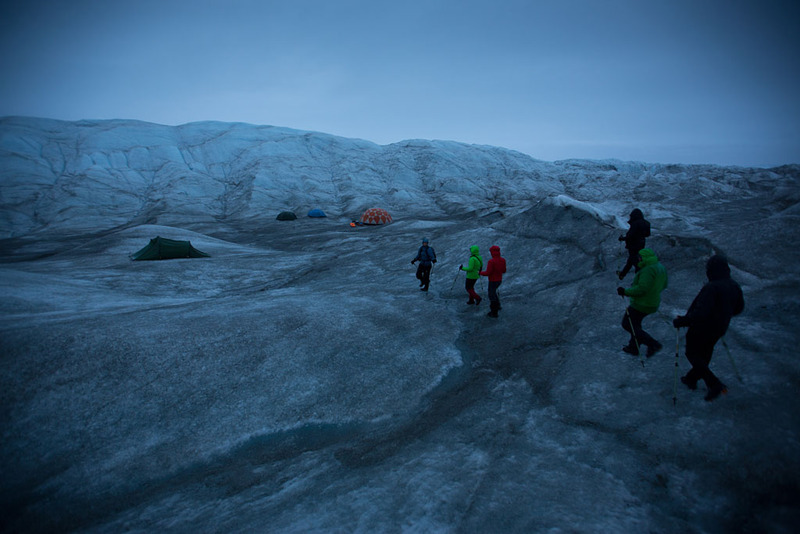 And arriving back at our camp at about 9pm after a great evening trek out on the ice. 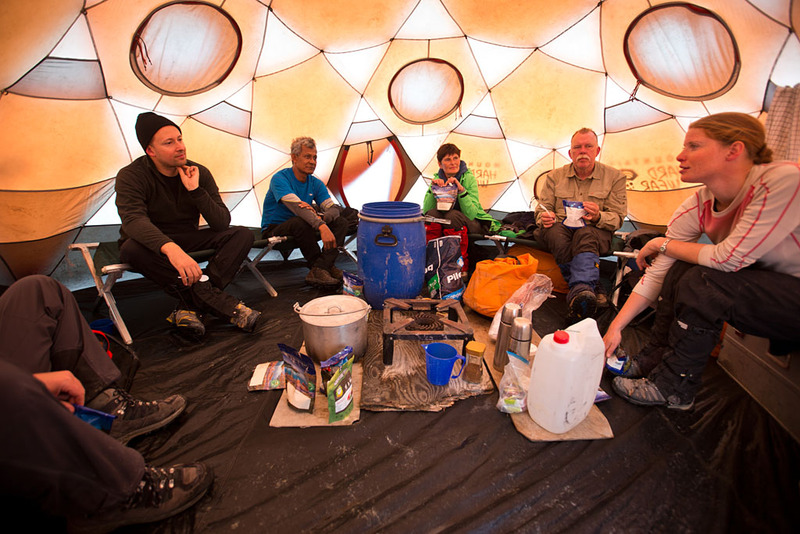 After taking off our crampons, we headed into the communal tent for hot drinks before retiring for the night. 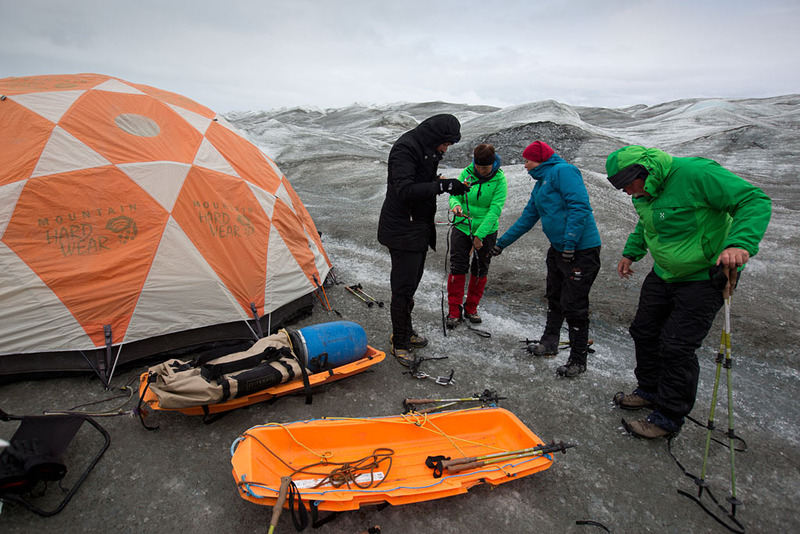 After a surprisingly good sleep in the arctic-grade, -30°C sleeping bag, we had breakfast in the communal tent (ready-to-eat, just-add-water cereal sachets), made a packed lunch, put on our crampons again and headed out to do some more trekking. 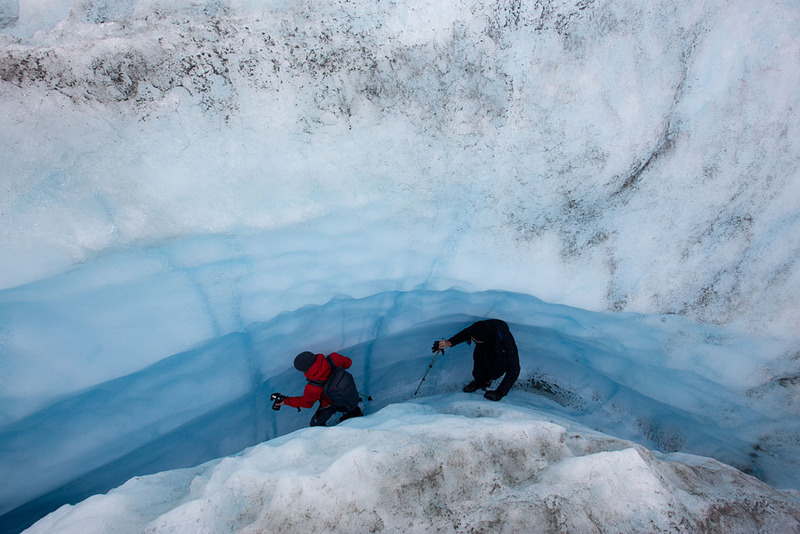 Matthias, one of the Swiss guys, checking out a deep crevasse with water flowing through it. 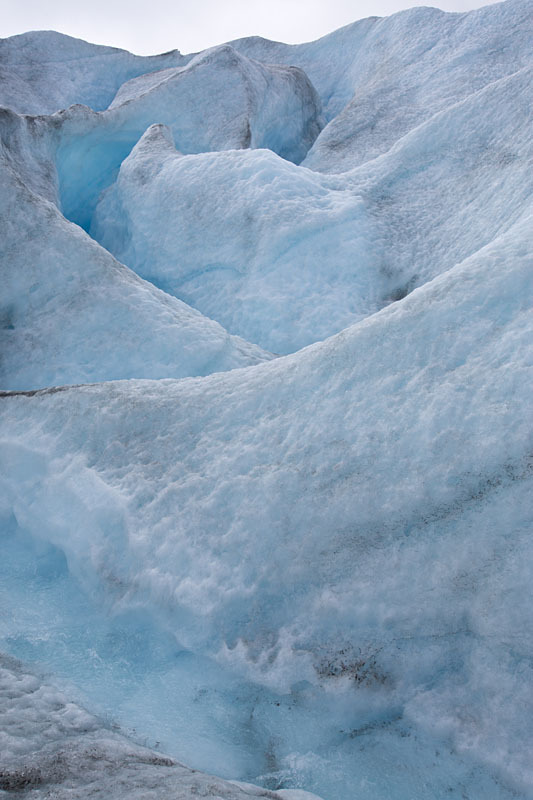 This was originally an ice cave but had recently collapsed to form a beautiful blue pond. 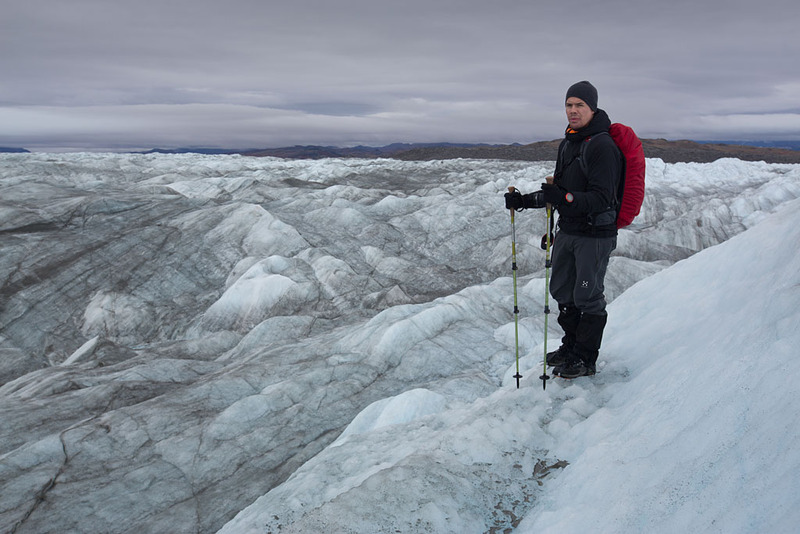 I was getting used to walking with the crampons on, making sure to firmly plant my foot for each step, walking with a wider stance, and always orientating my feet down, and not across a slope for maximum grip. Elouise telling us about the movement of the ice, which can be up to 30-40cms a day. Looking across the white expanse. 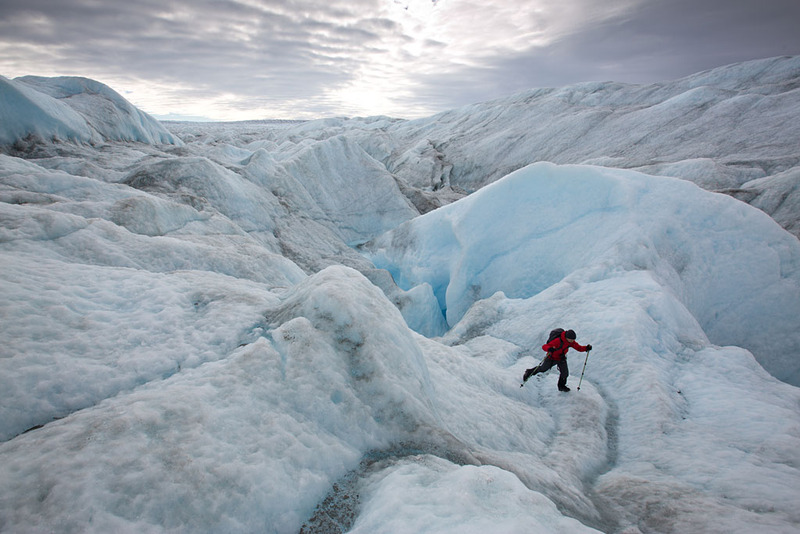 Heading up a small valley in the ice. 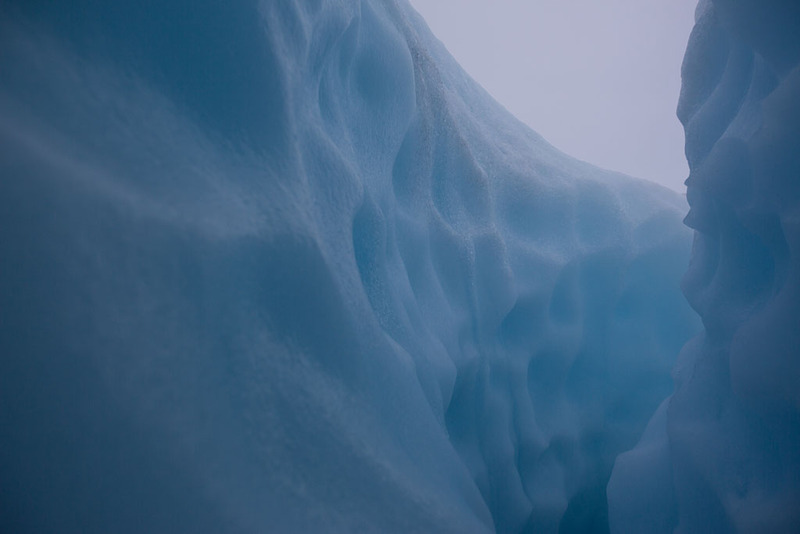 The vast white with hints of blue and grey was very beautiful and something I had never really experienced before. 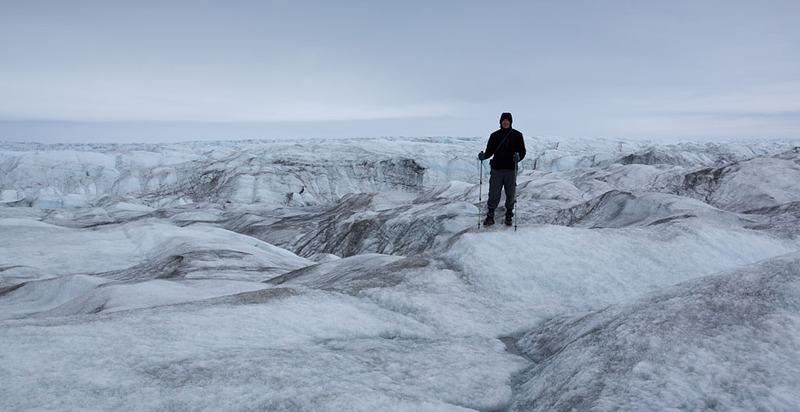 A panorama showing the scale and vastness of the seemingly endless expanse of ice we were trekking on. The German couple posing for a photo. 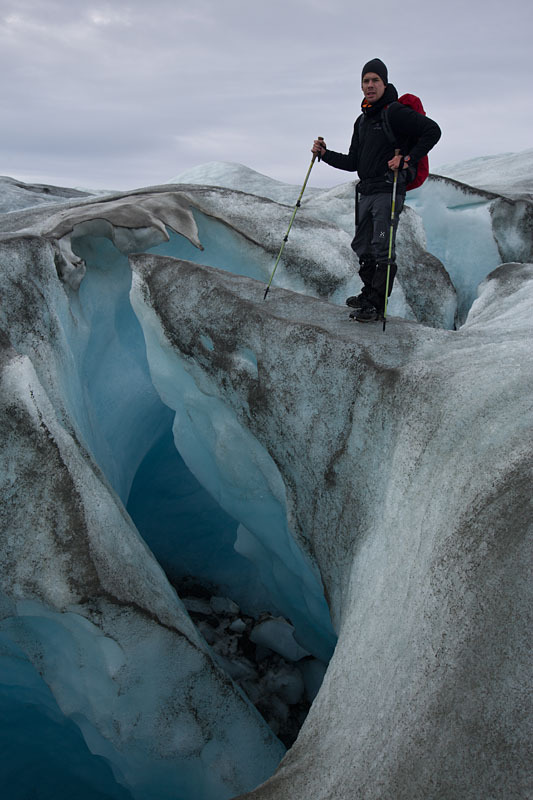 Matthias climbing over some of the multitude of ice ridges and crevasses we encountered. Checking out another channel in the ice. 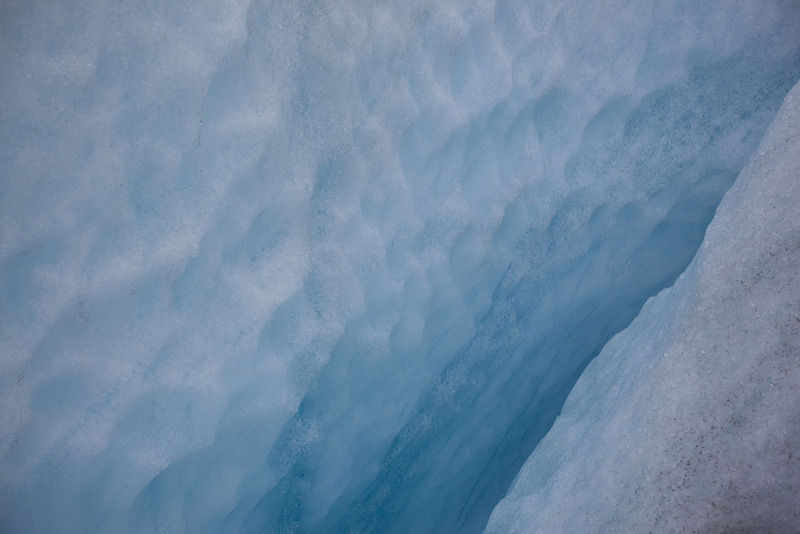 Looking at the ice up close you could see the tiny air bubbles from when it was originally snow, but that had now been compacted down into ice. An awesome and amazing experience and definitely worth the four flights it took to get here. 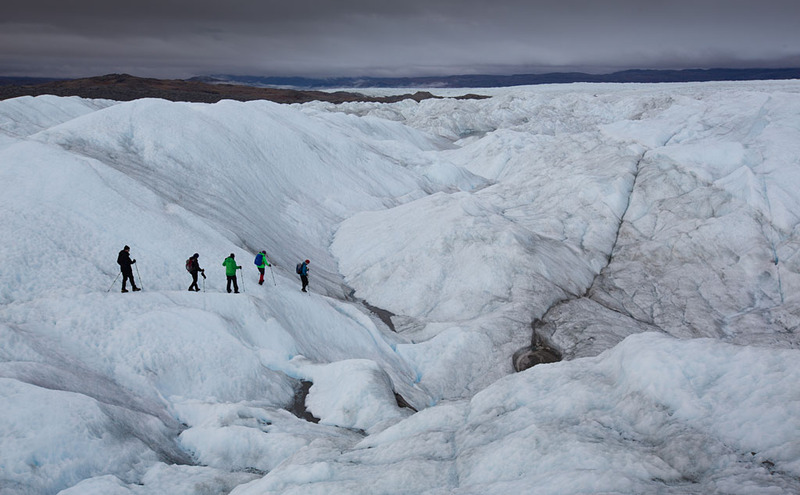 Trekking up and over an ice hill. 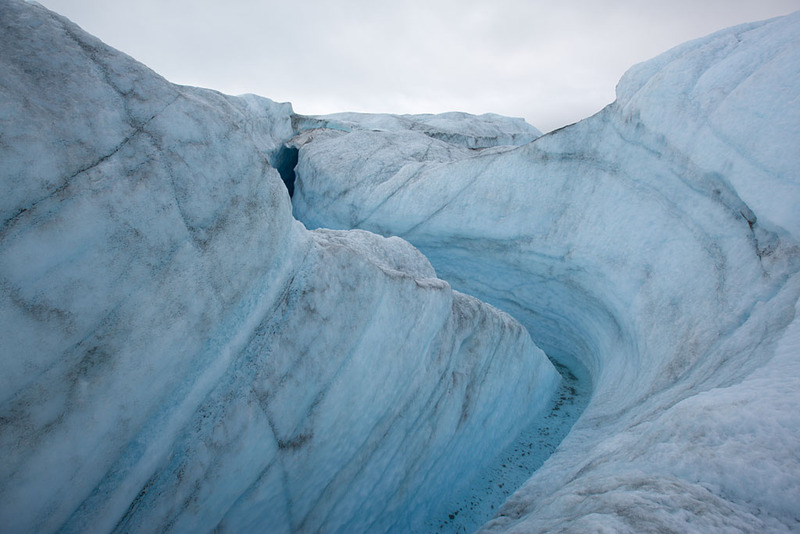 A river of melted ice flowing through a channel. 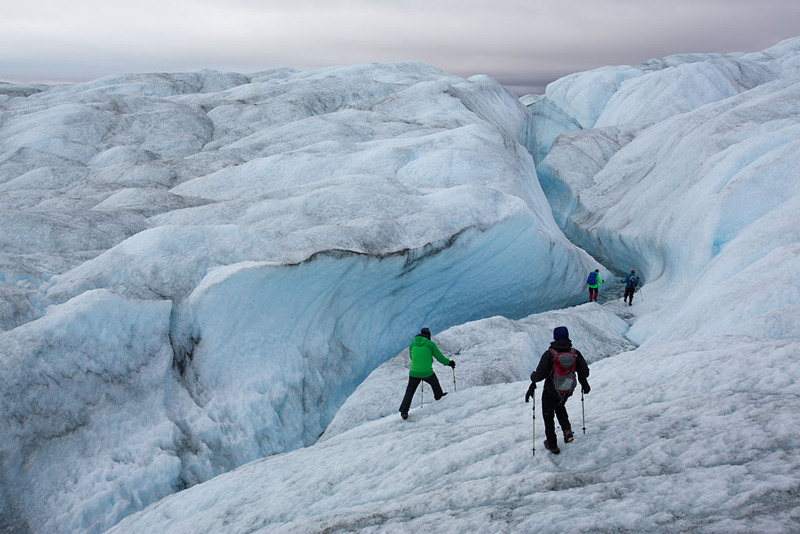 Continuing our trek through the valleys and hills of the ice sheet. Just before 12pm, we stopped for a break. A great place for a hot drink too. 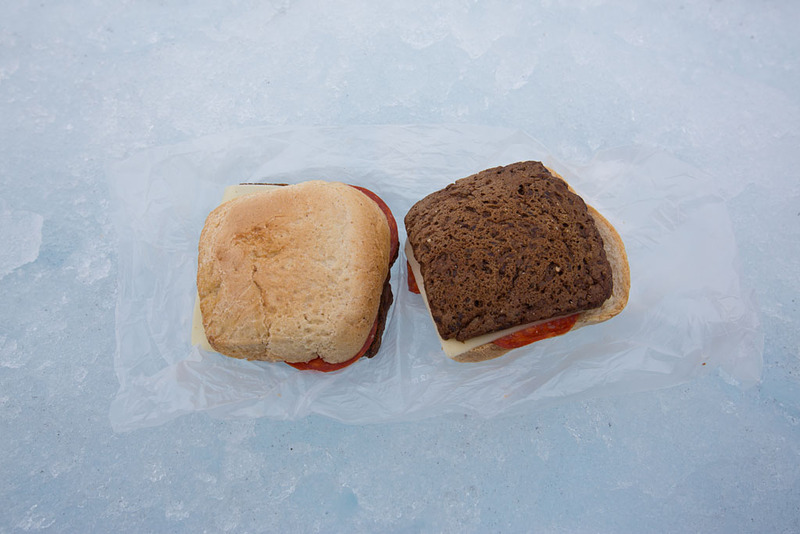 And our sandwiches we had packed for lunch. 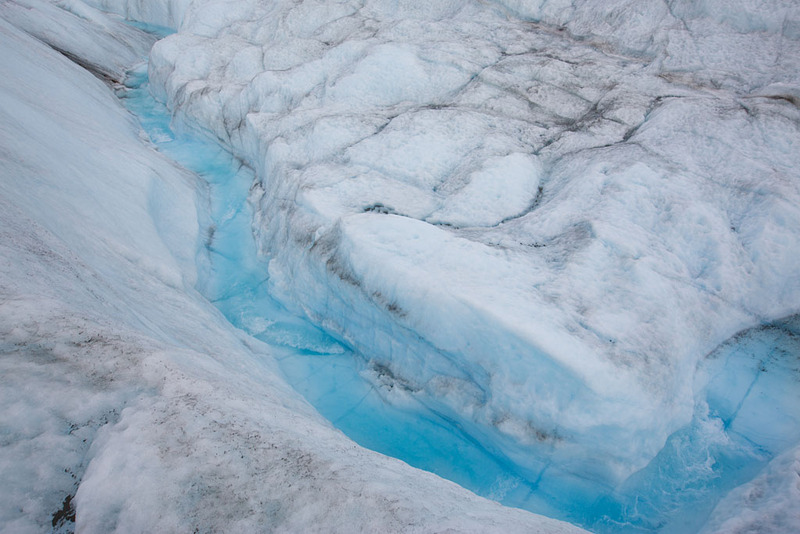 Another river of melted water cutting a channel through the ice. The different layers of ice visible. The ice resembled granite rock that you would see on a mountain side. The ice was very interesting to see up close and photograph. We then climbed up the ridge just above our camp, before descending down to it below. 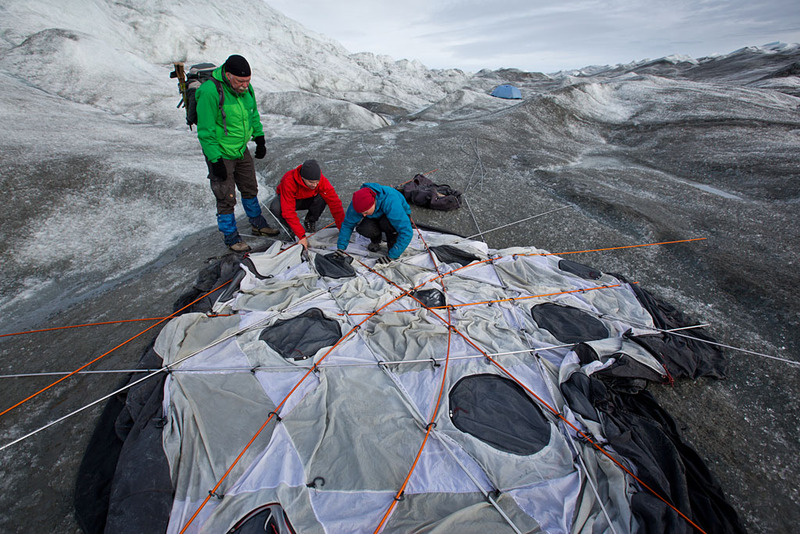 After a quick hot drink in the communal tent, we started to break down and pack up the tents. 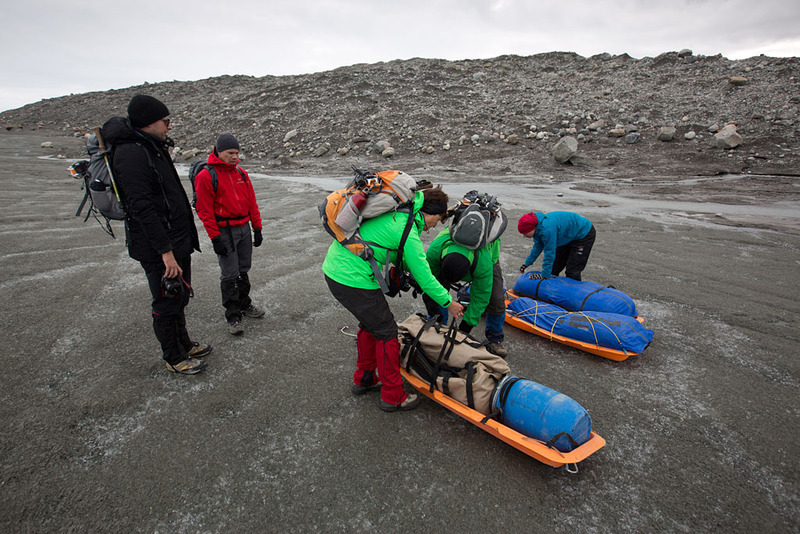 After loading up our gear onto the sleds, we began the trek back. Walking back down to our awaiting truck. 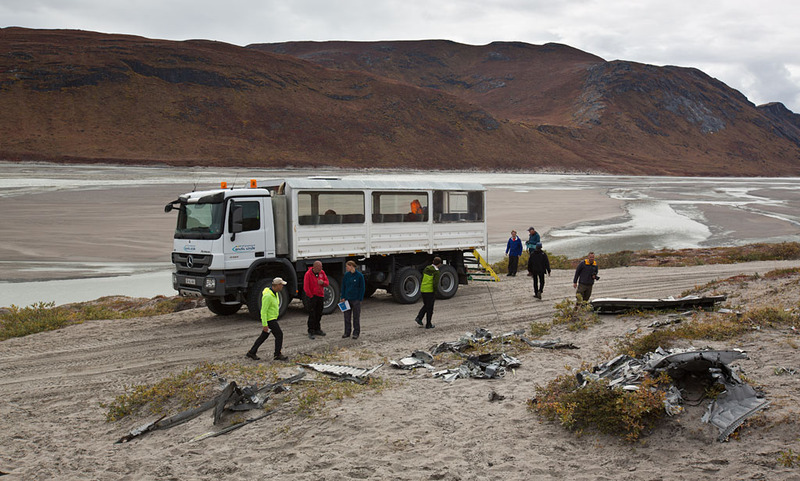 The truck had also brought out another group who were doing a day trip to the ice sheet. 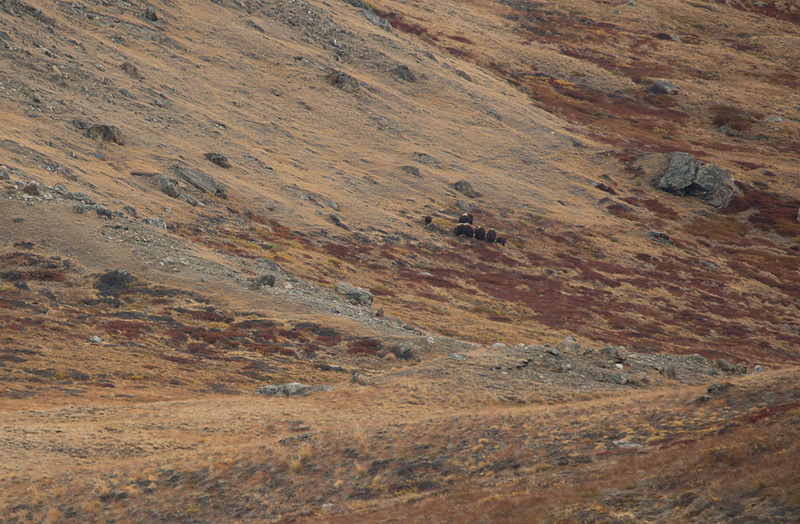 On the way back to Kangerlussuaq, we spotted in the distance a small group of Muskox. 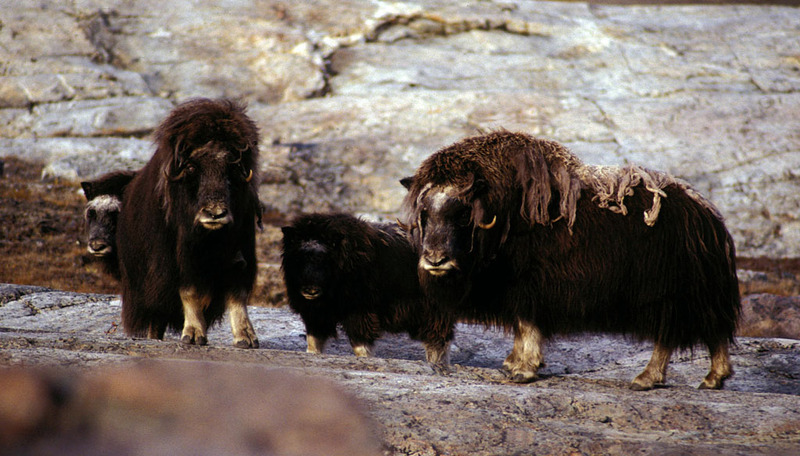 Despite their name and size (up to 400 kgs), Muskox are more closely related to sheep and goats than oxen. Originally only present on the northeastern fringes of Greenland, they were introduced into West Greenland and have since thrived, and are now selectively hunted for their meat. Unfortunately we didn't get a closer look, but below is a photo to show what these very woolly creatures look like up close (by Hannes Grobe, Creative Commons CC-BY-SA-2.5). We then continued on before stopping again for some more sight-seeing. 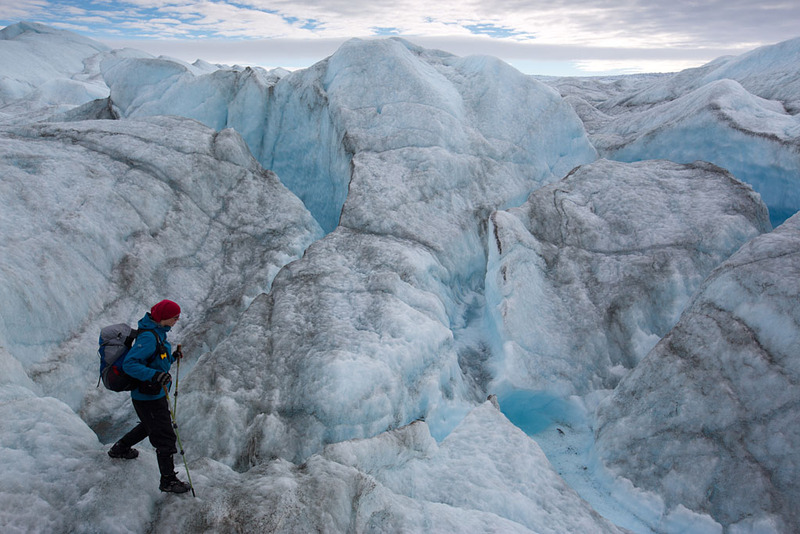 Taking in the view of a side-face of Russell Glacier. 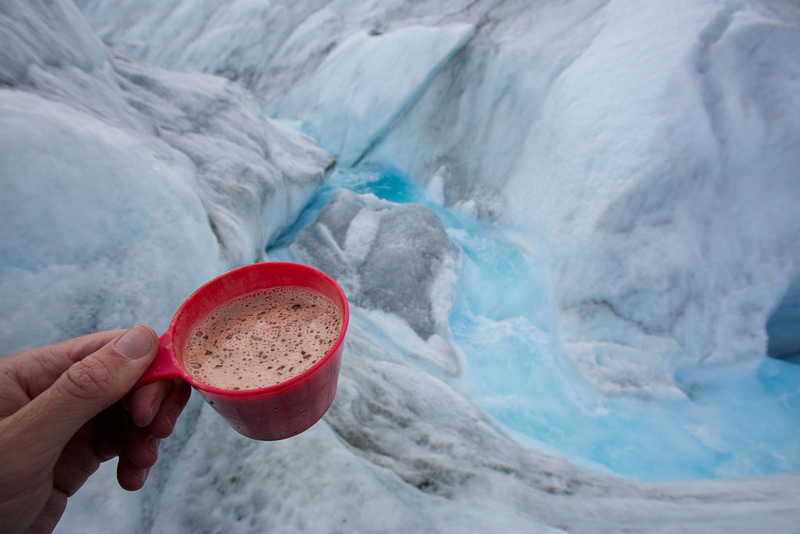 Another great place to enjoy a hot chocolate too. We got back to the Old Camp just after 6pm. 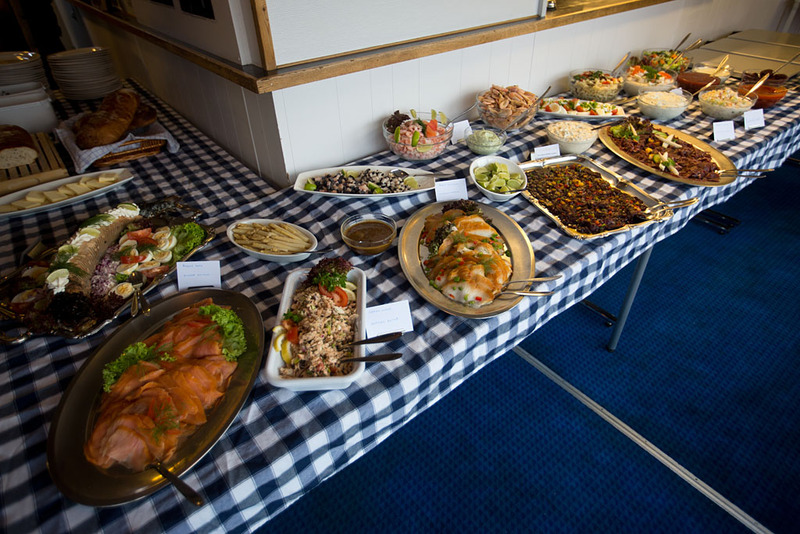 I had a quick shower before catching the bus back to Restaurant Roklubben for the Sunday evening Greenlandic buffet. The price per head was $55 but was included in my trip cost. 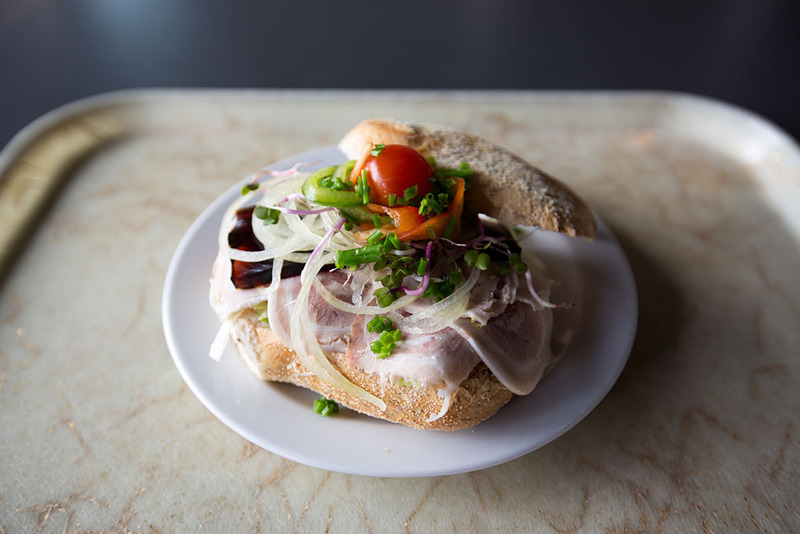 The spread of cold meats and salads. On the far right is the whale carpaccio. They later brought out the hot selection too. The dark meat in the centre of the plate is the whale carpaccio. 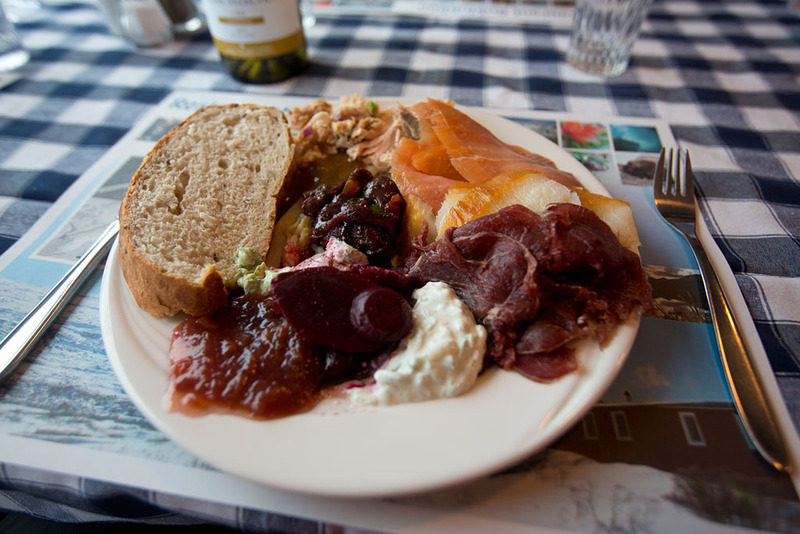 I also tried the smoked salmon, cold halibut and muskox carpaccio. I then tried some of the hot dishes. On the left is roast muskox. 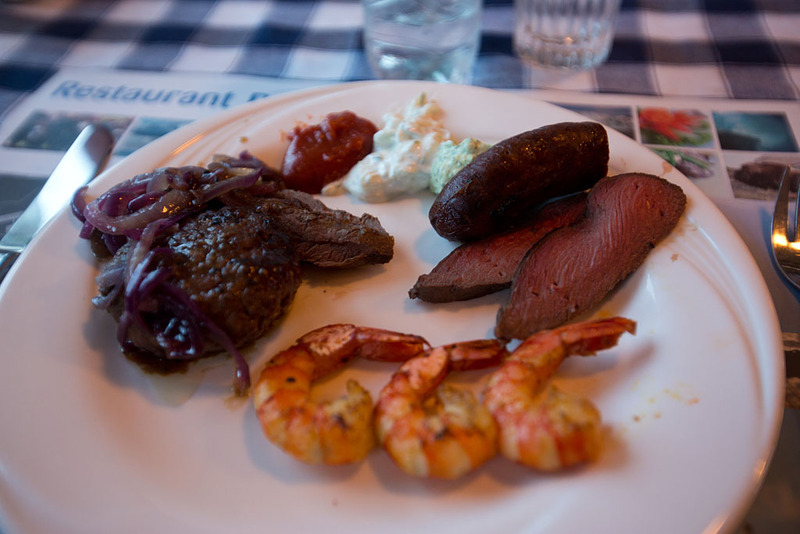 On the right is roast reindeer and reindeer sausage. A very tasty and sumptuous meal and a great way to finish an amazing day! 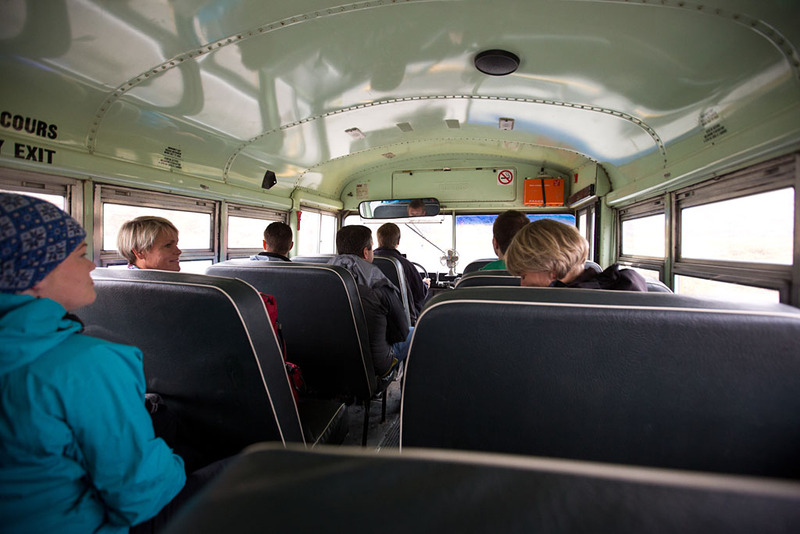 We then headed back to Kangerlussuaq, this time in an old yellow school bus. I got up at about 6am on the morning of day 5 for a run west along the road. 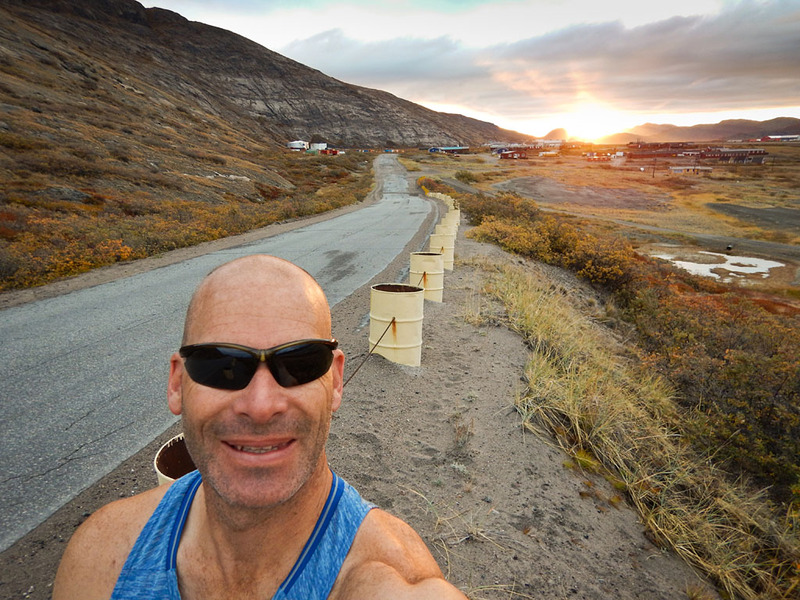 The rising sun just behind me with the Old Camp and Kangerlussuaq also visible in the distance. 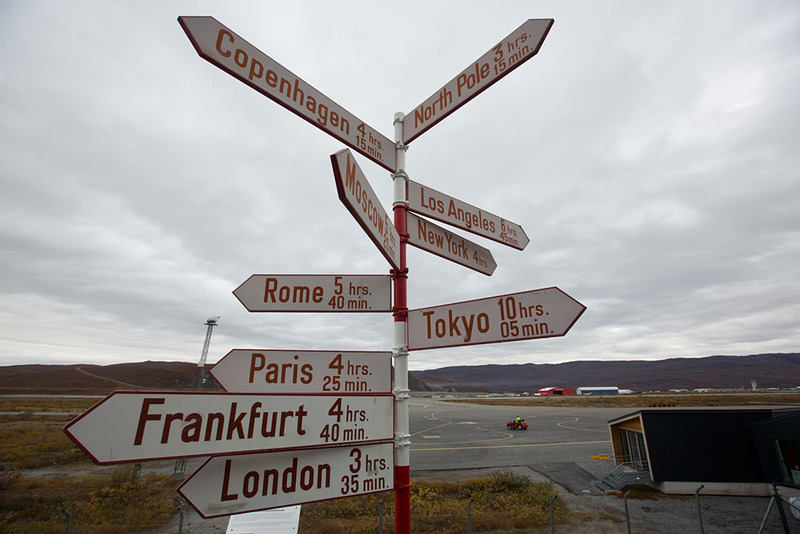 The flight back to Keflavík, Iceland wasn't until 7pm this evening, so I still had another full day in Kangerlussuaq. 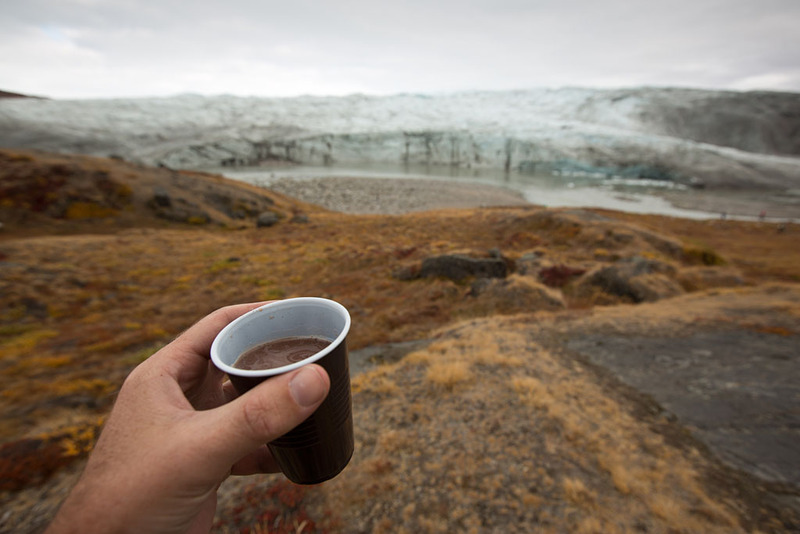 After breakfast back at the Old Camp we were picked up for a tundra excursion to see a bit of the landscape around Kangerlussuaq. Looking across the barren landscape. 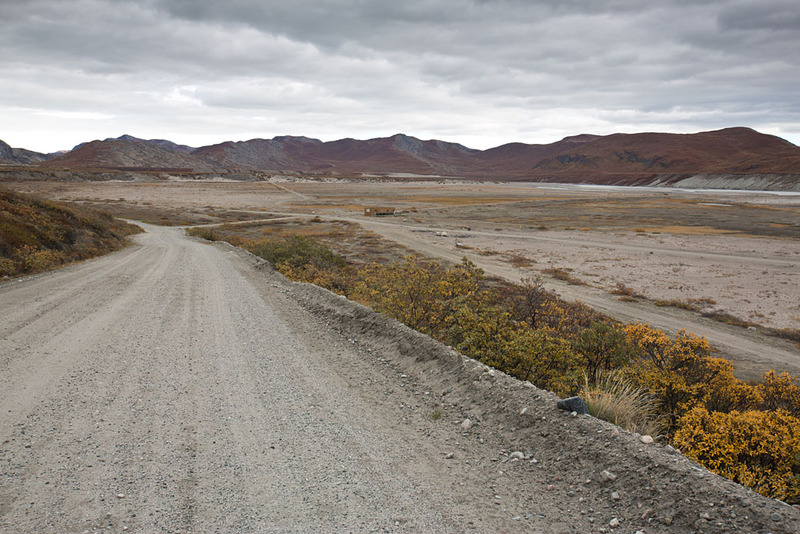 There is only ~140mm of rain per year around Kangerlussuaq, so it is technically desert. Russell Glacier in the distance. 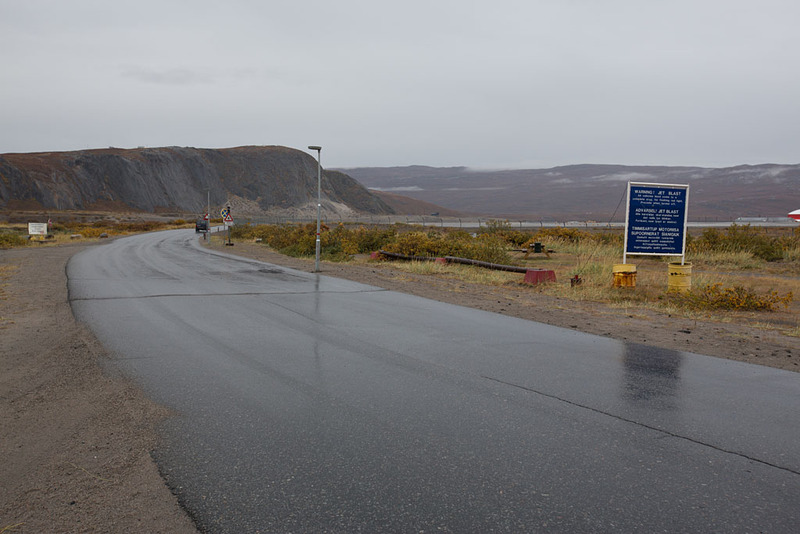 We then drove up to the hill above Kangerlussuaq. 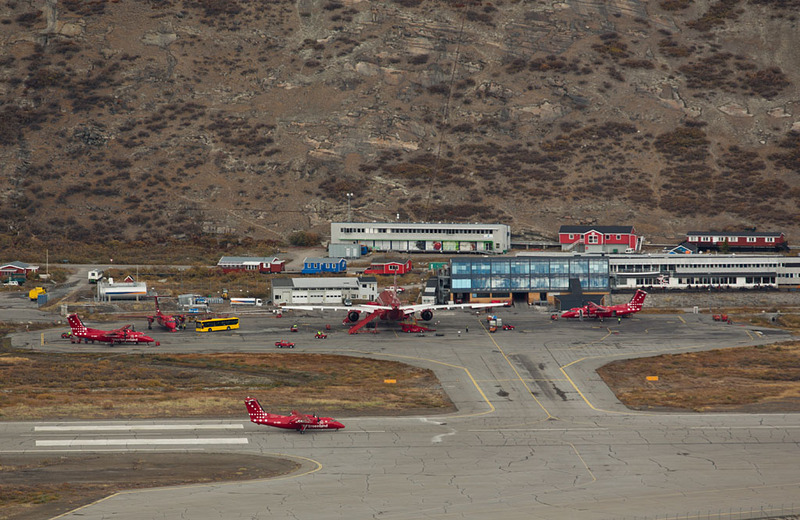 Five of the nine aircraft in the fleet of Air Greenland were at Kangerlussuaq Airport. After our excursion up into the hills, we were dropped off at the airport and had some lunch with Peter and Gorum at the cafeteria and chatted about our trips so far. 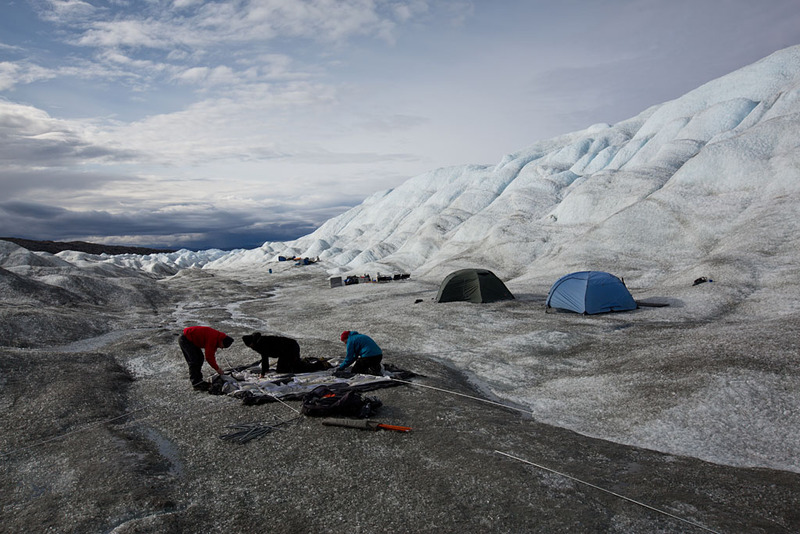 They had been out on a fishing trip in the fjord the day before and managed to catch some Greenland cod. 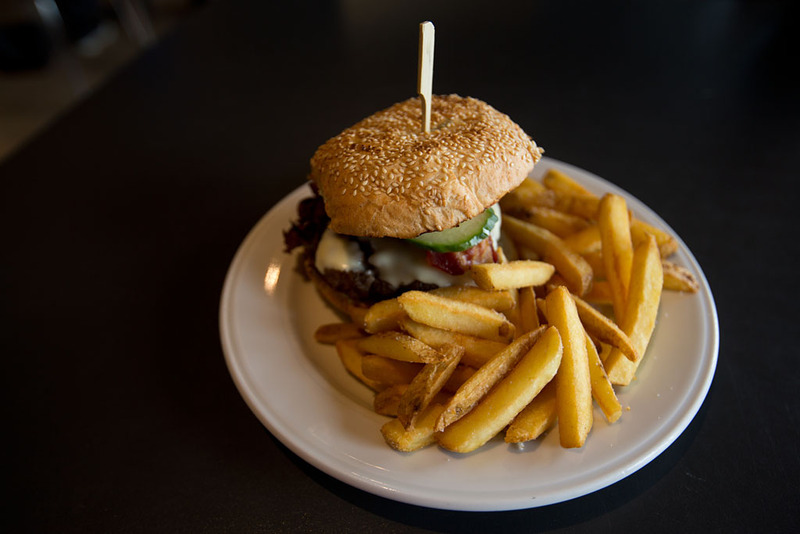 For lunch I decided to try the Kangerlussuaq burger which was not too bad. After lunch, myself, Peter and Gorum went for a hike up the road. In the distance is the local golf club. 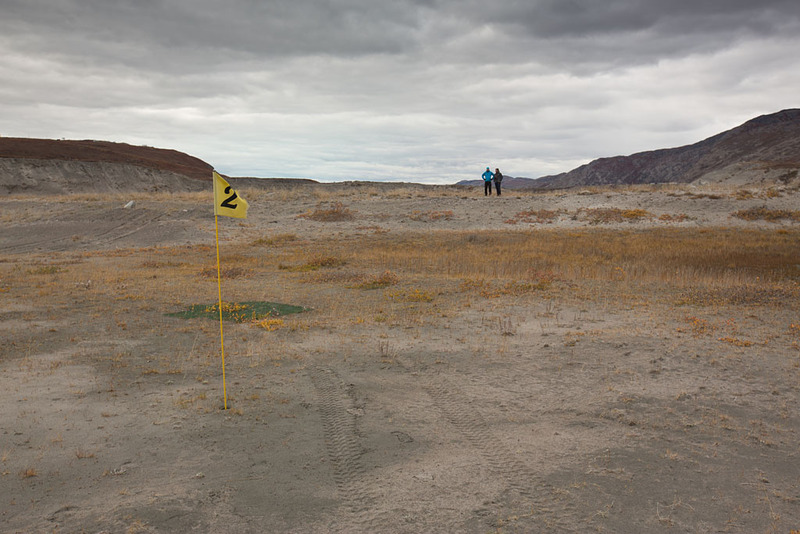 The golf course was conceived in 1986 by two helicopter pilots for Greenlandair, and was for a time the most northern golf course in the world until an arctic golf course in Canada was built. By the second hole. There has been one hole in one known of, by a Danish travel agent who was rewarded with a bottle of Johnnie Walker Red. We then continued our walk along the river. Hunting free zone. The RDAF C-130J buzzing us as we headed back to Kangerlussuaq! We then walked to the southern side of the airport. 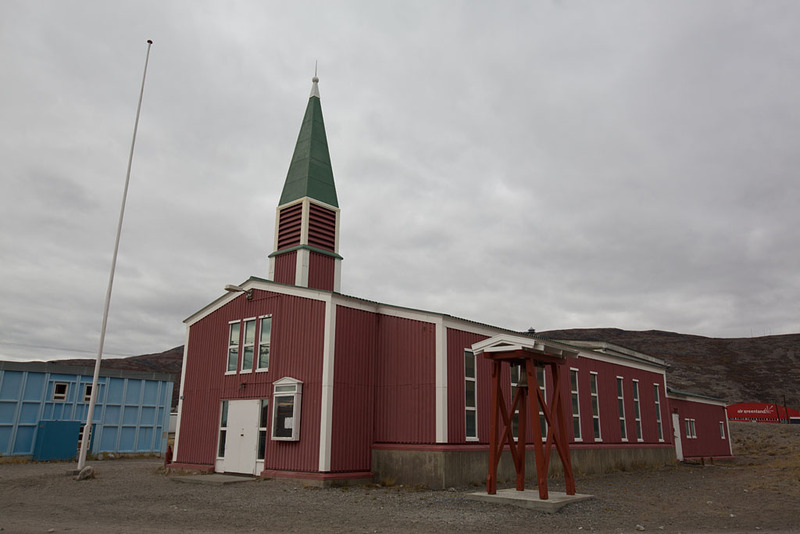 The non-demoninationl chapel. 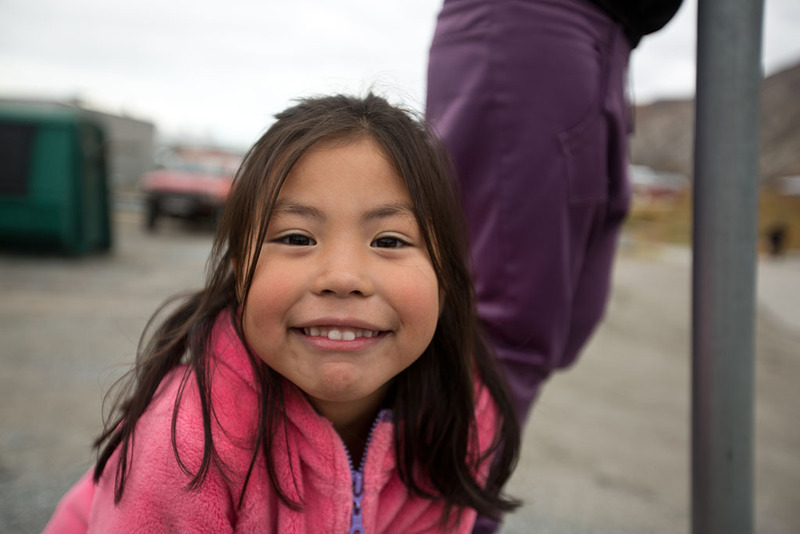 Apparently a pastor from Nuuk visits for Easter and Christmas etc. 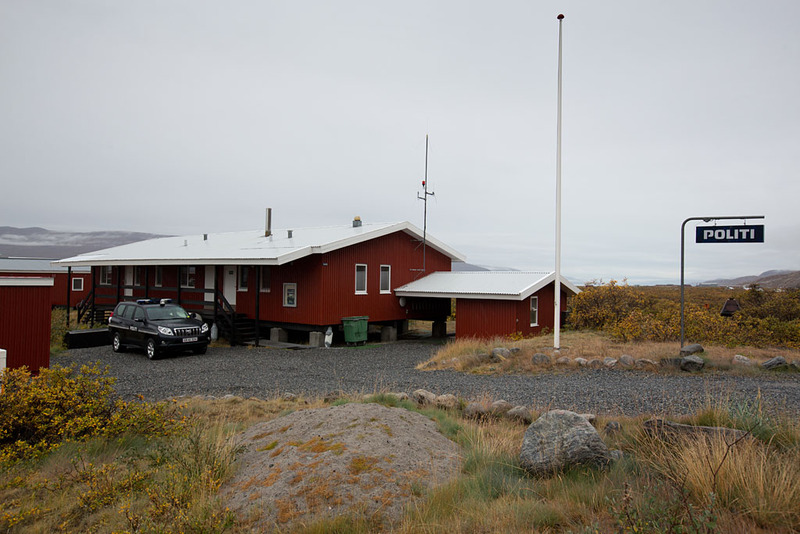 After walking back to the Old Camp, we picked up our bags and headed to the airport to check in for our flight to Keflavík. A couple of local kids hanging around outside the airport. 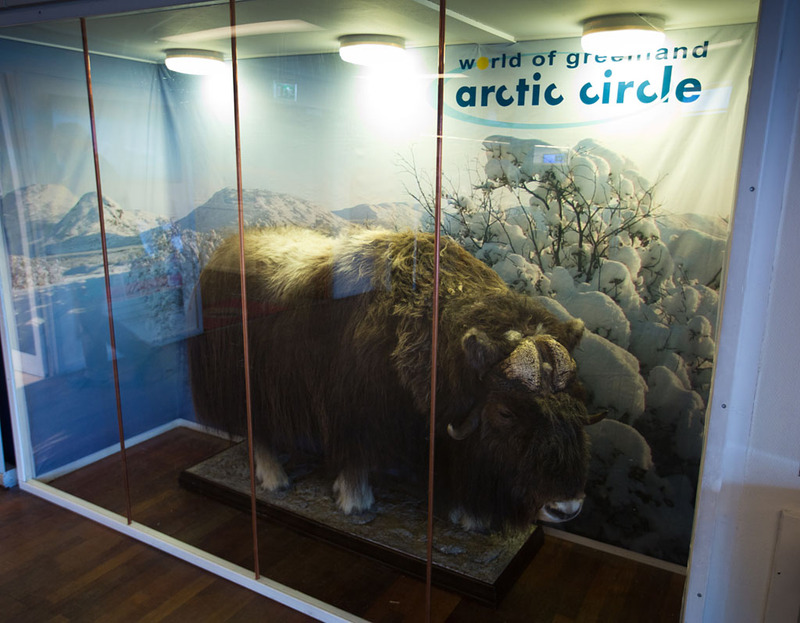 A stuffed Muskox just inside the airport. It was 90 minutes until to departure so I brought a fridge magnet for home and grabbed a cupcake from the cafeteria. Only 4 hours to New York. 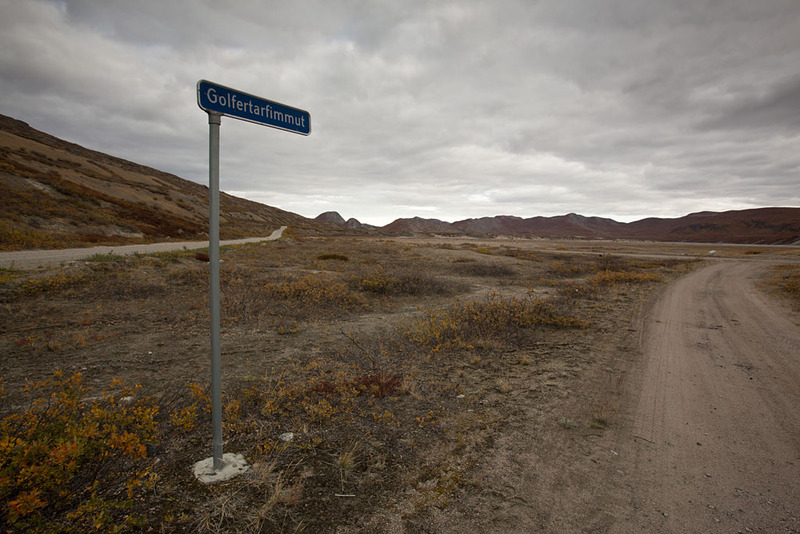 A sign that had been at Kangerlussuaq since the 1950's but had been recently refurbished. 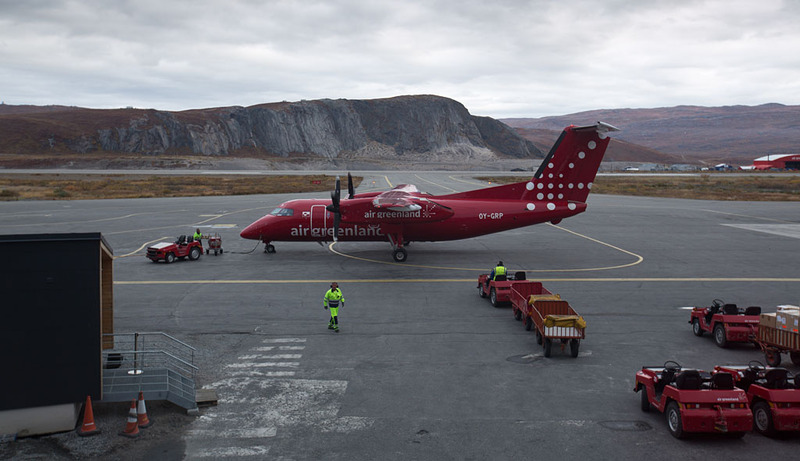 A recently arrived Air Greenland Dash-8 on the apron. Patrich and Oddný walking across the tarmac to board our flight. Taking off on time with the Old Camp just to our starboard side. 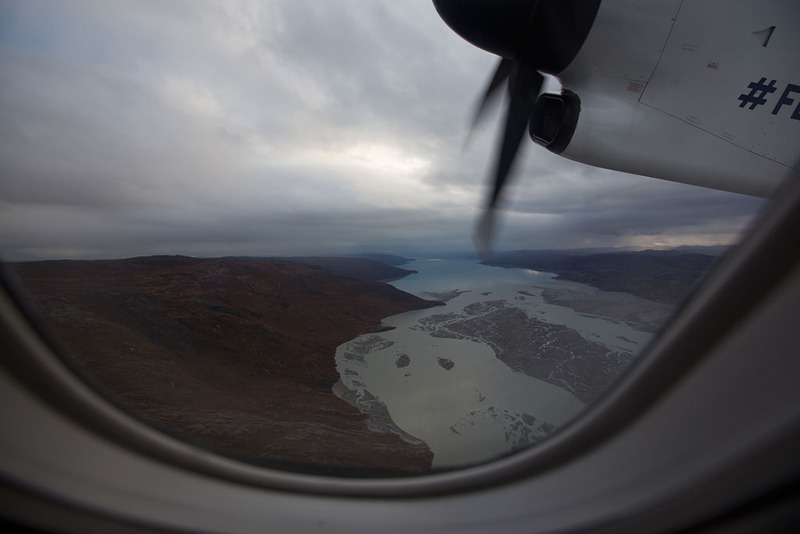 Looking down on Kangerlussuaq Fjord as we bank left. 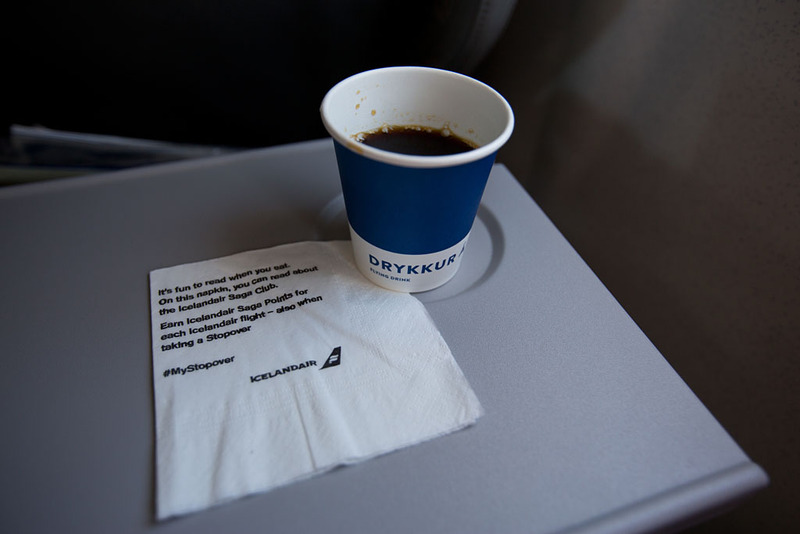 Coffee again served on the flight back to Iceland. 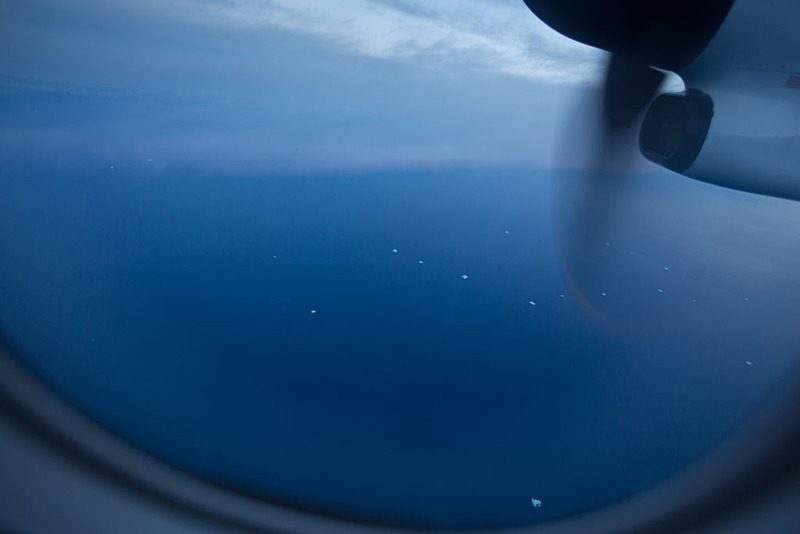 Looking down at the icebergs floating in the North Atlantic Ocean. 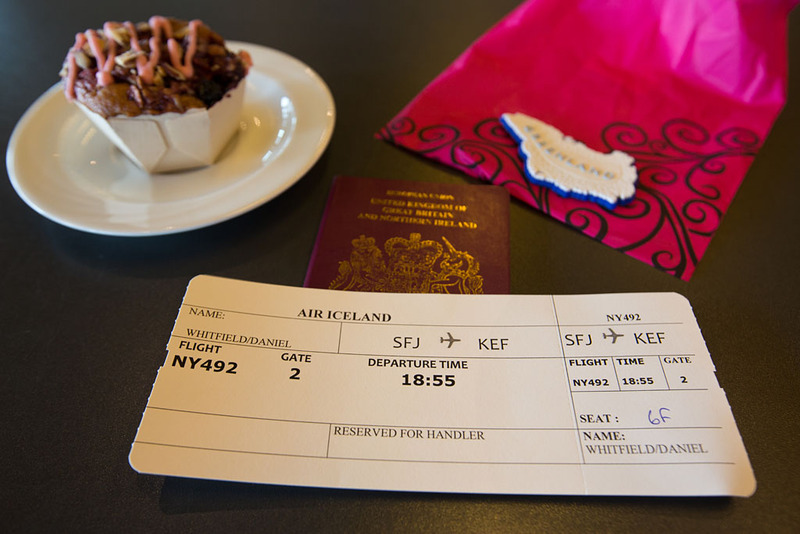 We arrived at Keflavík Airport on time just before midnight and were bussed to the terminal. Although Greenland is not part of the Schengen zone there was no immigration back into Iceland. I wasn't sure if my pack would arrive on the normal baggage belt or if it would come out in the oversize luggage area again. I stood half-way between them keeping an eye on both, and my pack finally came out via the normal luggage belt this time. Peter was catching another flight back to Copenhagen and then to Stockholm but Gorum was not flying back until 1pm and was staying at a hostel in Reykjavík for the night. 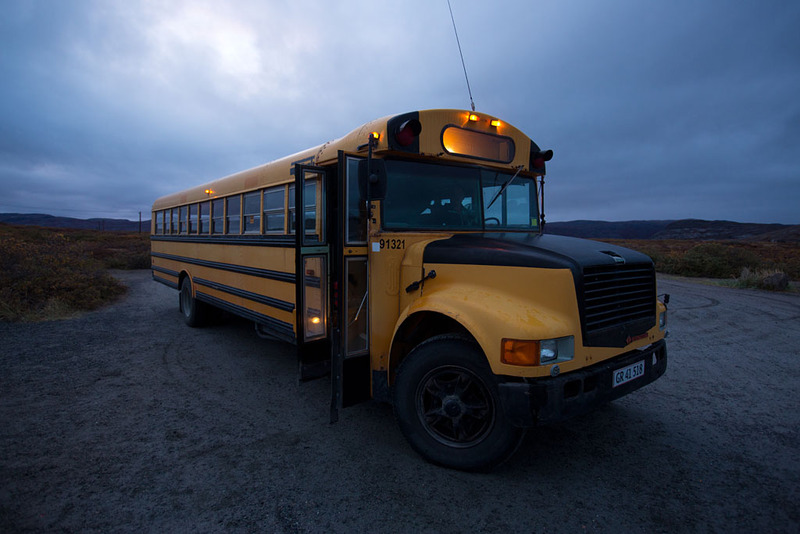 I had a ticket for the flybus for the 40 kilometre ride to Reykjavík, but Patrich and Oddný, who lived in Reykjavík and had parked their car at the airport, kindly offered to take both of us into the city with them. My room for my one night in Reykjavík at the Cabin Hotel after Patrich and Oddný had dropped me off. 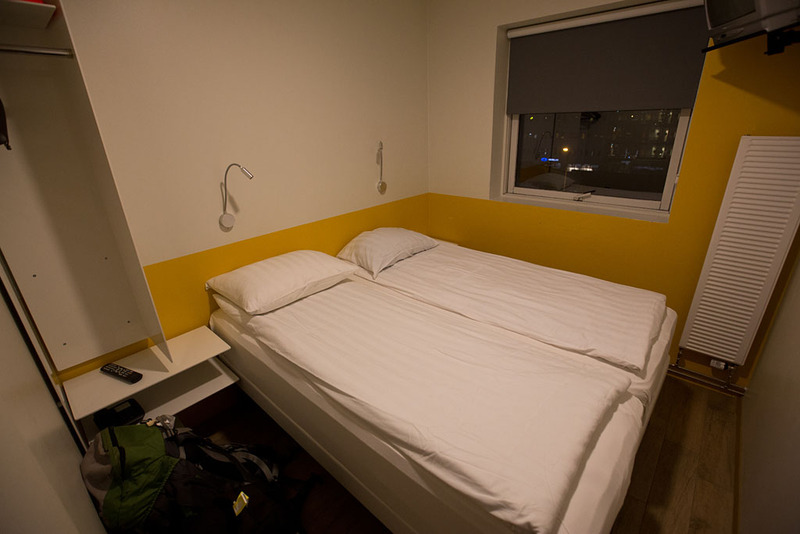 At $140 a night it was in the lower range for hotel rooms in Reyjavik but was perfectly comfortable for my short stay. I then got to sleep just after 1am to get some rest before my trip to the Icelandic south coast tomorrow morning.